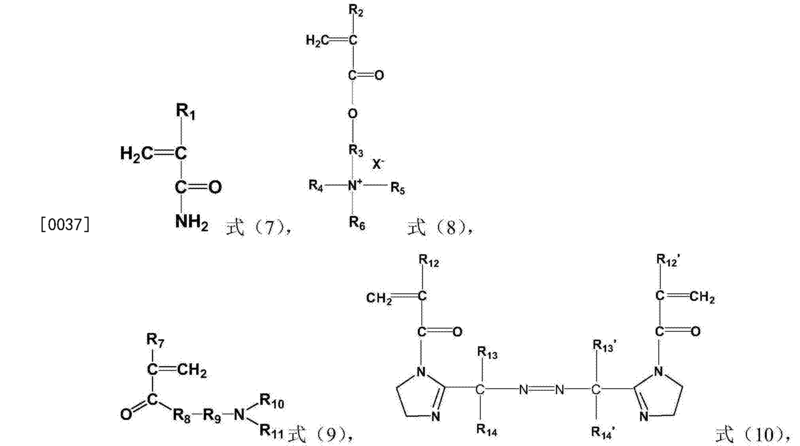 本发明公开了一种丙稀酰胺系共聚物及其制备方法和应用。 The present invention discloses an acrylamide copolymer and its preparation method and application. 所述丙烯酰胺系共聚物含有结构单元A、结构单元B、结构单元C和结构单元D，其中，所述结构单元A为式（1）所示的结构单元，所述结构单元B为式（2）所示的结构单元，所述结构单元C为式（3）所示的结构单元，所述结构单元D为式（4）所示的结构单元；所述丙烯酰胺系共聚物的粘均分子量为500万-1500万。 The acrylamide copolymer comprising structural units A, B structural unit, structural units C and the structural unit D, where the structural unit A represented by the formula (1), the structural unit B of the formula ( the structural unit shown in FIG. 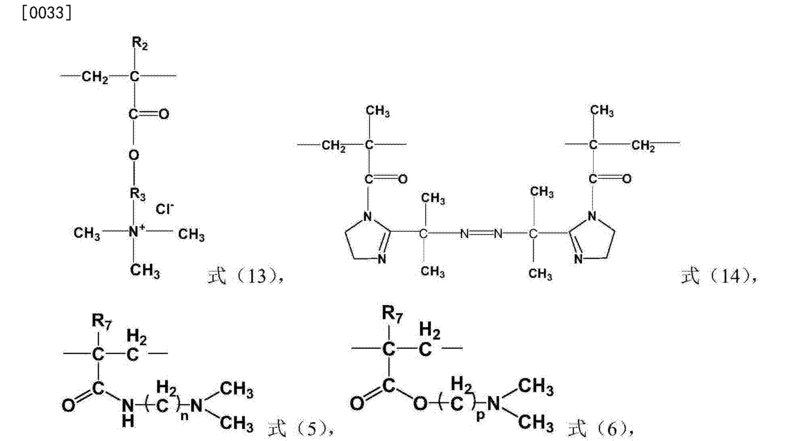 2) structural units, the structural unit C of the formula (3), the structural unit D of formula (4); said acrylamide copolymer had a viscosity average a molecular weight of 5 million 15 million. 本发明提供的丙烯酰胺系共聚物减阻率高、耐盐性高、抗高剪切性能好、水溶性好、与粘土稳定剂有良好的配伍性以及对地层伤害低。 Acrylamide copolymer of the present invention to provide a high drag, high salt tolerance, good resistance to high shear performance, good water solubility, and clay stabilizer has good compatibility and low formation damage. 本发明涉及一种丙烯酰胺系共聚物、丙烯酰胺系共聚物的两种制备方法以及所述丙烯酰胺系共聚物作为减阻剂的应用。  The present invention relates to acrylamide-based copolymer, prepared by two methods acrylamide copolymer is an acrylamide-based copolymer and the use as drag reducing agents. 作为非常规油气资源利用的典型代表一一页岩气（油）资源的开采已经成为全球非常规油气资源领域的一场革命，目前页岩气的开发与利用已成为世界各国着重关注与发展的重点技术。  As a typical representative of unconventional oil and gas resources utilization of eleven mining shale gas (oil) resources has become a revolution in the world of unconventional oil and gas resources, the development and utilization of shale gas has become the world focus on focus on technology and development. 由于页岩气藏等极致密油气藏具有渗透率极低(一般小于〇.5mD)、压裂压力高、易造成地层伤害的特点。 Because extremely dense, like shale gas reservoirs with very low permeability (typically less than 〇.5mD), high fracture pressure, easily causing formation damage characteristics. 必须采用"减阻水(滑溜水)压裂"工艺开采。 We must be "slickwater (slick water) fracturing" process mining. "减阻水(滑溜水)压裂"是水力压裂的一种。  "slickwater (slick water) fracturing" is a hydraulic fracturing. 与目前常规压裂体系（改性瓜胶交联体系）相比，减阻水(滑溜水)压裂不是依靠高粘性胶体携砂，而是以高的栗注排量携砂，实现将储层压裂成网状裂缝的最终目的。 Compared with the current conventional fracturing system (modified guar gum crosslinking system), slickwater (slick water) instead of relying on the high viscosity fracturing sand carrying colloid, but in the high injection Li displacement carrying sand, achieve reservoir fracture splitting into a laminate web of the ultimate goal. 与常规压裂体系相比，减阻水(滑溜水)压裂在成本上有较大优势的同时对地层的伤害较小。 Compared with conventional fracturing systems drag water (slick water) fracturing have a greater advantage in terms of cost, while the smaller formation damage. 减阻水压裂液核心助剂为水基减阻剂，在实际施工中，水基减阻剂的加入克服工作液在管线中的摩擦阻力，保证了栗注排量的提高，使压力最大限度地作用于压开地层和延伸地层裂缝，目前可用作水基减阻剂的主要有胍胶及其衍生物、纤维素衍生物、丙烯酰胺类聚合物。  slickwater fracturing fluid is water-based core DRA aid, in actual construction, the water-based drag reducing agent was added to overcome the frictional resistance of the working fluid in a pipeline, to ensure the displacement of the injection improve Li, to maximize the pressure acting on the pressure of the formation and the extension formation fractures open, the current is used as the water-based DRA major guar gum and derivatives thereof, cellulose derivatives, acrylamide-based polymer. 目前，采用胍胶、纤维素及其衍生物作为减阻水压裂中的减阻剂一定程度上提高了栗注排量、降低了管线中的摩擦阻力(US 5697444，US 5271466)，但仍无法满足减阻水压裂的要求，主要由于上述生物高分子存在以下缺点：（1)降阻性能有限；（2)由于胍胶、纤维素及其衍生物具有少量不溶物极易对地层造成伤害；（3)溶解时间较长。  Currently, the use of guar gum, cellulose and its derivatives as slickwater fracturing improved to some extent on the drag reducing agent injection Li displacement, reducing the frictional resistance in the pipeline (US 5697444, US 5271466) , but still can not meet the requirements of slickwater fracturing, mainly due to the presence of the biopolymer following drawbacks: limited (1) drop resistance properties; (2) due guar gum, cellulose and its derivatives having a small amount of insoluble matter easily causing formation damage; long (3) dissolution time. 在减阻水压裂施工中，多采用丙烯酰胺类聚合物（部分水解丙烯酰胺或阴离子型丙烯酰胺共聚物)作为减阻水压裂中的降阻剂，很大程度上提高了栗注排量、降低了管线中的摩擦阻力，但作为页岩气藏减阻水压裂的减阻剂使用，存在以下重要缺陷：（1)为了减少压裂过程中的"水敏效应"，抑制页岩中粘土组分的水化膨胀，必须在压裂液中加入小分子阳离子粘土稳定剂(如氯化钾、四甲基氯化铵等）。  In the slickwater fracturing, the use of acrylamide-based polymer (partially hydrolyzed acrylamide or anionic acrylamide copolymer) as slickwater fracturing reducing agent, greatly improves Li Note displacement, reducing the frictional resistance of the line, but as shale gas reservoirs slickwater fracturing drag reducing agent, the following important disadvantages: (1) in order to reduce the fracturing process "water sensitive effect" , inhibition of shale hydration swelling clay component must be added a small molecule cationic clay stabilizer (such as potassium chloride, tetramethyl ammonium chloride, etc.) in the fracturing fluid. 部分水解丙烯酰胺或阴离子型丙烯酰胺共聚物及其乳液产品与上述粘土稳定及的配伍性较差，极易产生沉淀；（2)部分水解丙烯酰胺或阴离子型丙烯酰胺共聚物作为页岩气藏减阻水压裂的减阻剂使用抗滤失性能较差，此种减阻水压裂液极易滤失到地层当中；（3)耐温抗盐性较差，尤其在高矿化度高二价离子含量条件下，分子结构不稳定，降阻效果下降较快。 Partially hydrolyzed anionic acrylamide or acrylamide copolymers and lotions poor compatibility with the clay and stable, easy to produce precipitate; (2) acrylamide or a partially hydrolyzed anionic acrylamide copolymer as shale gas slickwater fracturing fluid loss using anti-DRA poor performance, such slickwater fracturing fluid loss into the formation which can easily filtered; (3) temperature and salt resistance is poor, especially in high salinity High School under conditions monovalent ion content, the molecular structure is unstable, the reduction in resistance decreased rapidly. 专利US20090298721A1公开了一种减阻水压裂液的配方：向1000加仑去离子水中加入0.5加仑丙烯酰胺-co-丙烯酸共聚物(FR-56™)等阴离子型丙烯酰胺共聚物乳液作为减阻剂，再加入〇.15wt%碳酸钠或EDTA-2Na等络合剂，该减阻水压裂液具有优良的降阻性能， 室内平均降阻率达到65.0%，对耐盐性(尤其对二价钙离子的耐受性)有了一定程度的改善，但该种减阻水压裂体系作为页岩气减阻水压裂液使用，存在如下问题：（1)与粘土稳定剂(如氯化钾)和醇的的配伍性较差，与甲醇等醇作用极易产生沉淀；（2)抗滤失性能较差， 此种减阻水压裂液极易滤失到地层当中；（3)在实际施工中"水敏效应"显著；（4)极易产生"水堵"；（5)耐高速剪切性能差，在高速剪切作用下不稳定，降阻率下降很快；（6)耐温耐盐性较差，尤其在高矿化度高二价离子含量条件下，分子结构不稳定，  Patent No. US20090298721A1 discloses one kind of formulations slickwater fracturing fluids: 1,000 gallons to 0.5 gallons of deionized water was added -co- acrylamide acrylic acid copolymer (FR-56 ™) and other anionic acrylamide copolymer emulsion as DRA, 〇.15wt% sodium carbonate was added or complexing agent such as EDTA-2Na, slickwater fracturing fluid which has excellent barrier properties drop, the average indoor rate 65.0% reduction in resistance, salt tolerance (especially tolerance to divalent calcium ions) has been improved to some extent, but such systems as slickwater fracturing shale slickwater fracturing fluid used, the following problems: (1) clay stabilizer ( poor compatibility such as potassium chloride) and alcohols, and alcohols such as methanol easily effect precipitation; poor (2) anti fluid loss properties, such slickwater fracturing fluid loss into the formation which can easily filtered; (3) "water-sensitive effect" in the actual construction; and (4) easy to produce "water blocks"; (5) resistance to high shear poor performance under high speed shear instability, reducing the resistivity decreases rapidly ; (6) temperature salt is poor, especially in conditions of high content of divalent ions in the high salinity, the molecular structure is unstable, 阻效果下降较快；（7) 不易降解，容易对极度致密的页岩地层造成永久型伤害，污染地层，继而影响油气产量。 Blocking effect is reduced rapidly; (7) against degradation, likely to cause permanent damage to the extremely tight shale formations, formation damage, thereby affecting the oil and gas production. 与上述部分水解丙烯酰胺或阴离子型丙烯酰胺共聚物相比，阳离子型高分子量的丙烯酰胺共聚物作为减阻剂(US 356226，US 3868328)也有报道，此种结构共聚物与与粘土稳定剂(如KC1)相容性较好，与醇的配伍性较好，"水敏效应"不显著，不易"水堵"，但此类降阻剂大分子也不易降解，容易对致密的页岩造成永久性伤害。  Compared with the above-described partially hydrolyzed anionic acrylamide or acrylamide copolymers, high molecular weight cationic acrylamide copolymers as drag reducing agents (US 356226, US 3868328) have also been reported, and this structure of the copolymer and clay stabilizers (e.g., the KC1) good compatibility, good compatibility with alcohols, the "water-sensitive" effect is not significant, easily "water blocks", but such reducing agent is less likely to degrade macromolecules, easy to compact shale cause permanent damage. 因此，如何进一步提高减阻剂的耐高速剪切性能，提高压裂液对粘土的抑制性及抗滤失性，提高在高盐高剪切条件下的减阻率的稳定性同时具有可降解性，减少聚合物对地层的伤害仍是一个尚未解决的问题。  Therefore, how to further improve the resistance to high shear drag reducer performance, improved inhibition of clay and anti fluid loss fracturing fluid, improve the stability of drag reduction at high shear conditions while high salt has biodegradability, reducing the polymer formation damage is still an unresolved issue. 本发明的目的是克服现有技术的缺陷，提供一种减阻率高、耐盐性高、抗高剪切性能好、水溶性好、与粘土稳定剂具有良好配伍性，具有可降解性，且对地层伤害小的丙烯酰胺系共聚物及其制备方法和应用。  The object of the present invention to overcome the deficiencies of the prior art, there is provided a drag reducing rate, high salt tolerance, good resistance to high shear performance, good water solubility, and clay stabilizer with good compatibility, having degradation, and less formation damage acrylamide copolymer and its preparation method and application. 此外，本发明还提供一种丙烯酰胺系共聚物的制备方法，该制备方法包括将水相和油相混合形成反相乳液，然后在乳液聚合反应条件下，在引发剂的存在下，将该反相乳液进行聚合反应，所述水相为含有单体混合物的水溶液，所述油相含有有机溶剂和乳化剂，其中，所述单体混合物含有单体E、单体F、单体G和单体H，所述单体E为上述式(7)所示的单体， 所述单体F为上述式(8)所示的单体，所述单体G为上述式(9)所示的单体，所述单体H为上述式（1 〇)所示的单体，以所述单体混合物中单体的总摩尔数为基准，所述单体E的含量为5-95 摩尔％，所述单体F的含量为2.5-90摩尔％，所述单体G的含量为0.5-90摩尔％，所述单体H 的含量为0.0001-1摩尔％;所述乳液聚合反应的条件使得聚合反应后所得聚合物的粘均分子量为500万-1500万。  Further, the present invention also provides a process for preparing an acrylamide-based copolymer, which method comprises preparing the aqueous and oil phases mixed to form a reverse phase emulsion, and then the reaction under emulsion polymerization conditions in the presence of an initiator , the inverse emulsion polymerization reaction, the aqueous phase is an aqueous solution containing a monomer mixture, the oil phase contains an organic solvent and emulsifier, wherein the monomer mixture containing the monomer E, monomer F., single G monomers and body H, the monomer of formula E above (7) of a monomer of formula F above (8) shown monomer which G is the formula ( 9) a monomer represented by the above-described monomer is a monomer of formula H (1 square) as shown, to the total moles of the monomer mixture of the monomers, the content of the monomer E is 5-95 mol%, the content of the monomer is 2.5 to 90 mole% F, G of the monomer content is 0.5 to 90 mol% of the monomer content of 0.0001 mol% H; the after the emulsion polymerization conditions such that the polymerization of the resulting polymer viscosity average molecular weight of 5 million 15 million. 此外，本发明还提供了所述丙烯酰胺系共聚物作为减阻剂的应用。  Further, the present invention also provides the use of the acrylamide copolymer as a drag reducer. 在本发明提供的所述丙烯酰胺系共聚物中，通过将含有偶氮基团的结构单元通过共聚的方法，引入到含有丙烯酰胺结构单元和阳离子单体结构单元的大分子链上，通过控制聚合条件得到适宜分子量的共聚物，使得该丙烯酰胺系共聚物具有自降解性，在较低的地层温度下（一般大于60°C)可以实现自降解，可降低对地层的伤害，同时该丙烯酰胺系共聚物在高盐高剪切条件下具有较高的减阻率，并且与粘土稳定剂(如KC1和NaCl)具有较高的配伍性。  acrylamide in the copolymer of the present invention, provided, by the method of the azo group-containing structural units through copolymerization, into the molecular chain a structural unit containing an acrylamide monomer and a cationic structural unit by suitably controlling the polymerization conditions to obtain molecular weight of the copolymer, so that the acrylamide copolymer having from degradation, the formation at lower temperatures (typically greater than 60 ° C) can be achieved from degradation, it can reduce the damage to the formation, Meanwhile, the acrylamide copolymers have higher drag reduction in a high salt under high shear conditions, and with a clay stabilizer (e.g., KC1 and NaCl) has high compatibility. 从而得到本发明。 To obtain the present invention. 而且，本发明的丙烯酰胺系共聚物在用作减阻剂时水不溶物含量明显较低；与助排剂(如甲醇)有较好的相容性。  Further, acrylamide copolymer of the present invention when used as drag reducer significantly lower content of water-insoluble matter; and drainage aid (e.g., methanol) have good compatibility. 具体地，实施例1-6中制得的丙烯酰胺系共聚物的粘均分子量可达到500-1500万； 在水中的不溶物含量仅为〇.〇1重量％;在2500印111的剪切速率下，该聚合物在水/醇溶液不产生沉淀，可以完全溶解;将实施例1-6中制得的丙烯酰胺系共聚物溶于浓度为2重量％、4 重量％、8重量％、10重量％、12重量％的似(：1或KC1溶液中，将其配制成500mg/L和1000mg/L 的溶液，减阻率均可达到60%以上;在较低的地层温度(大于60°C)的条件下，该聚合物能进行自降解，对地层的伤害小于10%。  Specifically, Examples 1-6 acrylamide adhesive copolymer prepared average molecular weight of up to 500-1500 million; the insoluble content in wt% water is only 〇.〇1; 111 printed in 2500 shear rate, the polymer does not produce a water / alcohol solution was precipitated, it can be completely dissolved; Examples 1-6 were prepared in an acrylamide-based copolymer dissolved in a concentration of 2 wt%, 4 wt%, 8 wt%, 10 wt%, 12 wt% of the like (: 1 or KC1 solution, formulated into 500mg / L and 1000mg / L solution, drag reduction can reach 60% or more; in the lower formation temperature under conditions (greater than 60 ° C), the polymer can self-degradation, damage to the formation is less than 10%. 此外，本发明提供的丙烯酰胺系共聚物的制备方法(溶液聚合法和反相乳液聚合法)具有简便且单体转化率高的优点。  In addition, preparation of an acrylamide-based copolymer of the present invention provides (inverse emulsion polymerization and solution polymerization method) is simple and high monomer conversion advantage. 本发明的其他特征和优点将在随后的具体实施方式部分予以详细说明。  Other features and advantages of the present invention will be described in detail in a subsequent portion of the detailed description. 以下对本发明的具体实施方式进行详细说明。  The following detailed description of specific embodiments of the present invention. 应当理解的是，此处所描述的具体实施方式仅用于说明和解释本发明，并不用于限制本发明。 It should be understood that the specific embodiments described herein are only to illustrate and explain the present invention and are not intended to limit the present invention. 本发明中，所述C1-C4的烷基的实例可以包括但不限于：甲基、乙基、正丙基、异丙基、正丁基、仲丁基、异丁基和叔丁基。  In the present invention, examples of the C1-C4 alkyl groups may include, but are not limited to: methyl, ethyl, n-propyl, isopropyl, n-butyl, sec-butyl, isobutyl and tert butyl. 所述亚烷基是指烷烃失去两个氢原子后的残基，所述两个氢原子可以为同一个碳原子上的两个氢原子，也可以不同碳原子上的两个氢原子，可以是直链的，也可以是支链的，例如，所述亚乙基可以是-CH 2CH2-或-CH(CH3)-。  The alkylene group means a residue obtained by loss of two hydrogen atoms, an alkane, the two hydrogen atoms may be two hydrogen atoms on the same carbon atom, two hydrogen may be on different carbon atoms atoms, may be straight chain or may be branched, e.g., the ethylene may be -CH 2CH2- or -CH (CH3) -. 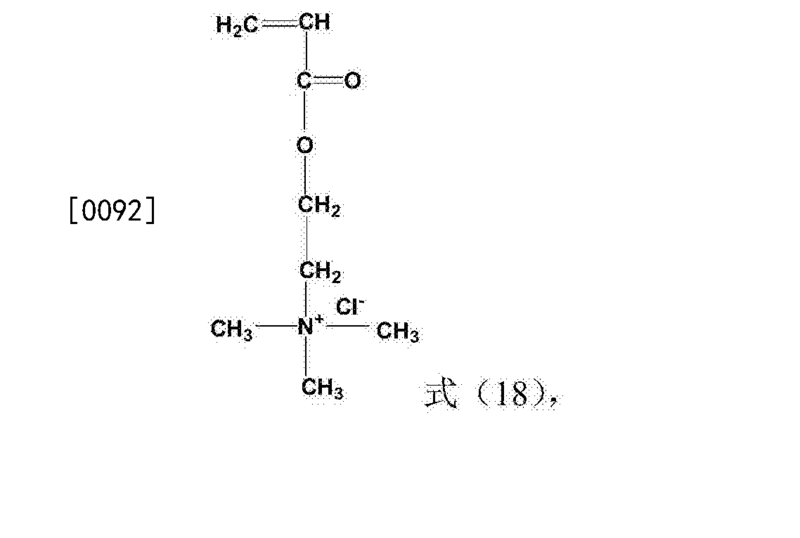 本发明中，所述亚烷基可以是直链的，也可以是支链的。  In the present invention, the alkylene group may be linear, it may be branched. 所述C1-C4的直链或支链亚烷基的实例可以包括但不限于：亚甲基、亚乙基、亚正丙基、亚异丙基、亚正丁基、亚仲丁基、亚异丁基、亚叔丁基。 Examples of the C1-C4 straight-chain or branched alkylene group may include, but are not limited to: methylene, ethylene, n-propylene, isopropylene, n-butylene, sec-butyl, isobutylene, tert-butylene. 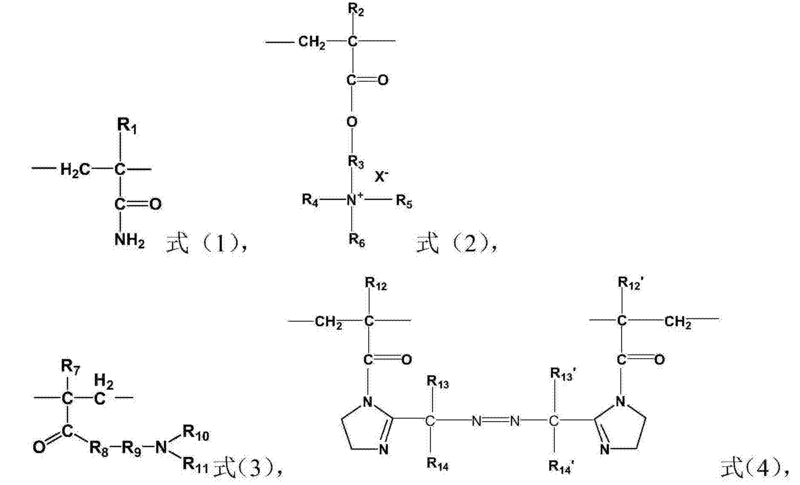 其中，RAH或者C1-C4的烷基，优选情况下，RAH或者甲基;R3为C1-C4的直链或支链亚烷基，优选为亚乙基(如，-CH2CH2-);R7为H或者C1-C2的烷基;n和p各自独立地为1-10的整数，优选情况下，n和p各自独立地为1 -4的整数。  wherein, the RAH or C1-C4 alkyl group, Preferably, the RAH or methyl; R3 is C1-C4 straight or branched chain alkylene group, preferably an ethylene group (e.g., -CH2CH2-) ; R7 is H or an alkyl group of C1-C2; n-and p are each independently an integer of 1-10, preferably, n and p are each independently an integer of 1-4. 根据本发明，所述聚合反应开始时，所述单体混合物的重量与水和单体混合物的总重量的比例为本领域技术人员所公知的各种比例，一般地，所述单体混合物的重量与水和单体混合物的总重量的比例可以为0.05-0.5:1，优选为0.15-0.4:1。  According to the invention, the start of the polymerization reaction, well known to those skilled in the weight ratio of the various ratios of the total weight of the monomer mixture and the monomer mixture of water present, in general, the single the weight ratio of the total weight of the monomer mixture and the aqueous mixture may be from 0.05 to 0.5: 1, preferably from 0.15 to 0.4: 1. 根据本发明，所述引发剂可以为本领域各种引发剂。  According to the invention, the initiator may be present various initiators art. 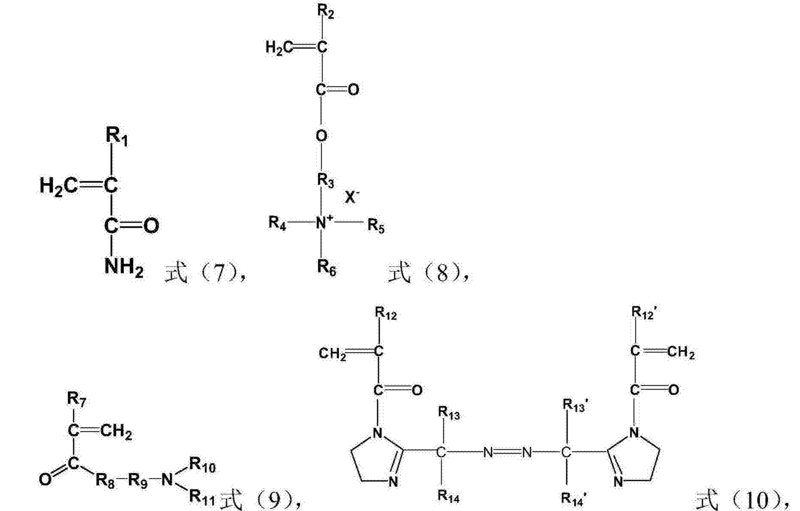 例如，选自偶氮系引发剂和氧化还原系引发剂。 For example, selected from azo initiators and redox based initiators. 以所述单体混合物中单体的总摩尔数为基准，所述偶氮系引发剂的用量为0-10摩尔％，所述氧化还原系引发剂的用量为0-10摩尔％，且所述偶氮引发剂和氧化还原引发剂的总用量优选满足：所述引发剂的总用量为单体混合物中单体的总摩尔数的0.0001-10摩尔％。 In total moles of the monomer mixture of the monomers of the azo initiator in an amount of 0-10 mol%, the redox initiator used is 0-10 mol%, and the preferably a total amount of said azo initiators and redox initiators meet agent: the total initiator is used in an amount from 0.0001 mol% of the total number of moles of monomers in the monomer mixture. [0041 ]本发明中，优选地，所述偶氮系引发剂为选自2，2 偶氮二异丁基脒盐酸盐和/或2，2' -偶氣二[2-(2-味唑琳-2_丙烷)-二盐酸盐]。  In the present invention, preferably the azo initiator is selected from 2,2'-azobis isobutyl amidine hydrochloride, and / or 2,2 '- even gas-bis [2- (2- Lin -2_-imidazol-propane) - dihydrochloride]. 所述氧化还原系引发剂包括氧化剂和还原剂，优选地，所述氧化剂与所述还原剂的摩尔比为0.5-3.5:1，满足上述比例的条件下，所述氧化剂的用量可以为单体混合物中单体的总摩尔数的0.0001-0.01摩尔％，优选为单体混合物中单体的总摩尔数的0.001-0.008 摩尔％ ;优选情况下，所述氧化剂选自过硫酸铵、过硫酸钾、过硫酸钠和过氧化氢中的至少一种，进一步优选为过硫酸铵和/或过硫酸钾;所述还原剂的用量可以为单体混合物中单体的总摩尔数的0.0001-0.005摩尔％，优选为单体混合物中单体的总摩尔数的0.001-0.004 摩尔％ ;所述还原剂可以为无机还原剂(助还原剂），优选地，所述无机还原剂为选自亚硫酸氢钠、亚硫酸钠、雕白粉、硫代硫酸钠、硫酸亚铁、保险粉、抗坏血酸和脲中的至少一种，进一步优选为亚硫酸氢钠和/或硫代硫酸钠。  The redox initiators include an oxidizing agent and a reducing agent, preferably the oxidizing agent and the reducing agent molar ratio is 0.5 to 3.5: 1, under conditions satisfying the above ratio, the amount of the oxidizing agent can be 0.0001 to 0.01% by mole of the total moles of monomer in the monomer mixture, preferably 0.001-0.008 mol% of the total number of moles of monomers in the monomer mixture; preferably, the oxidizing agent is selected from ammonium persulfate, potassium persulfate, sodium persulfate and hydrogen peroxide, at least one, more preferably ammonium and / or potassium persulfate; the reducing agent may be used in an amount of 0.0001 moles of the total monomers in the monomer mixture -0.005 mol%, preferably 0.001 to 0.004 mol% of the total number of moles of monomers in the monomer mixture; the inorganic reducing agent may be an inorganic reducing agent (co-reducing agent), preferably, the reducing agent is selected from sodium bisulfite, sodium sulfite, Rongalit, sodium thiosulfate, ferrous sulfate, sodium hydrosulfite, ascorbic acid and at least one of urea, more preferably sodium hydrogen sulfite and / or sodium thiosulfate. 在本发明中，需要特别指出地，所述单体H在聚合过程中同时起到扩链剂的作用， 这是因为所述单体H中的有两个双键基团可参与聚合反应，形似"架桥"。  In the present invention, it is necessary to point out, the monomer acts as a chain extender H simultaneously during polymerization, since there are two double bonds of the monomer groups can participate in H polymerization, the shape of "bridging." 另外，本发明提供的丙烯酰胺系共聚物对地层的伤害降低，这可能是由于该聚合物中具有偶氮基团，易在较低的地层温度下(大于60°C)发生自降解反应。  Further, an acrylamide-based copolymer of the present invention provides a reduced formation damage, which may be due to the polymer having an azo group, easily at low formation temperatures (greater than 60 ° C) occurs from degradation reactions. 根据本发明，所述溶液聚合反应还可以在各种助剂存在下进行，所述助剂可以选自螯合剂和其他助剂中的至少一种；以所述单体混合物中单体的总摩尔数为基准，所述螯合剂的用量为0-2摩尔％，优选为0.0001-1摩尔％，进一步优选为0.0001-0.05摩尔％，所述其他助剂的用量可以为0-2摩尔％，优选为0.0001-1摩尔％，进一步优选为0.0001-0.2摩尔％;优选地，所述螯合剂和其他助剂的用量使得：以所述单体混合物中单体的总摩尔数为基准，所述助剂的用量为〇. 0001-4摩尔％。  According to the invention, the solution polymerization reaction may also be carried out in the presence of various adjuvants, the adjuvant may be selected from at least one chelating agent, and other auxiliary agent; the monomer mixture to a single the total moles of the body as a reference, the chelating agent in an amount of 0-2 mol%, preferably from 0.0001 to 1 mol%, more preferably 0.0001 to 0.05 mol%, the other additives may be used in an amount of 0-2 mol%, preferably from 0.0001 to 1 mol%, more preferably 0.0001 to 0.2 mol%; dosage preferably, the chelating agent, and other additives such that: the total number of moles of the monomer mixture of the monomers , an amount of the adjuvant billion. 0001-4 mol%. 根据本发明，所述螯合剂可以为选自乙二胺四乙酸二钠(EDTA)、二乙三胺五乙酸、 柠檬酸、柠檬酸盐和聚羟基丙烯酸中的至少一种，进一步优选为m)TA、柠檬酸盐和二乙三胺五乙酸中的至少一种，所述柠檬酸盐可以为柠檬酸钾、柠檬酸钠、柠檬酸钙和柠檬酸铵等。  According to the invention, the chelating agent may be selected from disodium ethylenediaminetetraacetate (EDTA), at least one diethylenetriamine pentaacetic acid, citric acid, citrates, and acrylic acid polyhydroxy further preferably m) TA, citrate and diethylenetriamine pentaacetic acid in at least one of the citrate salt may be potassium citrate, sodium citrate, calcium citrate, and ammonium citrate and the like. 根据本发明，所述其他助剂可以为选自尿素、甲酸钠、异丙醇和次磷酸钠中的至少一种，优选为尿素和/或甲酸钠。  According to the invention, the other additives may be urea and / or urea selected from sodium formate, sodium formate, isopropyl alcohol and sodium hypophosphite at least one, preferably. 本发明的发明人发现，在同时存在上述各种引发剂和助剂的条件下，溶液聚合法能够得到粘均分子量可控的丙烯酰胺系共聚物。  The present inventors have found that, while the presence of the above initiators under conditions and auxiliaries, solution polymerization can be controlled viscosity average molecular weight acrylamide copolymer. 根据本发明，所述溶液聚合反应的条件可以为本领域常规的条件。  According to the present invention, the condition of solution polymerization conditions may be conventional in the art. 例如，所述溶液聚合反应在惰性气体存在下进行，聚合反应条件可以包括:温度为0-50°C，时间为1-24小时，pH值为5-13;优选情况下，温度为4-45°C，时间为4-24小时，pH值为5-9。 For example, the solution polymerization reaction is carried out in the presence of an inert gas, polymerization conditions may include: a temperature of 0-50 ° C, time 1 to 24 hours, pH = 5-13; Preferably, the temperature is 4- 45 ° C, time is 4-24 hours, pH = 5-9. 所述pH值可以通过加入酸或碱进行调节，所述酸优选为无机酸，所述无机酸优选为盐酸、硫酸、磺酸、硝酸和磷酸中的至少一种;所述碱可以是无机碱或有机胺类化合物，例如可以选自氢氧化钠、氢氧化钾、氨水、甲胺、乙胺、乙醇胺和三乙醇胺中的至少一种，优选为氢氧化钠。 The pH can be adjusted by addition of acid or base, the acid is preferably an inorganic acid, the inorganic acid is preferably at least one of hydrochloric acid, sulfuric acid, nitric acid and phosphoric acid; the base can be an inorganic base or an organic amine compound, for example, be selected from sodium hydroxide, at least one, preferably sodium hydroxide, potassium hydroxide, ammonia, methylamine, ethylamine, ethanolamine, and triethanolamine. 本发明的发明人在研究中发现，采取下述条件能够进一步提高聚合物的分子量： 即，优选地，所述溶液聚合反应的过程包括依次进行的三个阶段:第一阶段的反应条件包括:温度为0-10°C，优选为4-10°C，时间为1-15小时，优选为3-10小时;第二阶段的反应条件包括:温度为15-30 °C，优选为20-30 °C，时间为3-8小时，优选为3-5小时;第三阶段的反应条件包括:温度为35-50°C，优选为35-45°C，时间为2-14小时，优选为2-12小时。  The present inventors have found in the study, the following conditions take molecular weight polymers can be further improved: i.e., preferably the solution polymerization process comprising three stages in sequence: the first stage reaction conditions include: a temperature of 0-10 ° C, preferably 4-10 ° C, to 15 hours, preferably 10 hours; the second stage reaction conditions comprise: a temperature of 15-30 ° C, preferably of 20-30 ° C, the time is 3-8 hours, preferably 3-5 hours; the reaction conditions of the third stage comprising: a temperature of 35-50 ° C, preferably 35-45 ° C, time is 2-14 hours, preferably 2-12 hours. 其中，具有式（11)所示结构的单体可以通过以丙烯酰氯(或甲基丙烯酰氯)和具有通式A所示结构的胺在甲醇溶液和碱性条件下反应得到。  wherein, having the formula (11) may be a monomer represented by the structure of acryloyl chloride (or methacryloyl chloride) and an amine having a structure shown in Reaction Formula A to give methanol solution and at basic conditions. 具有式（12)所示结构的单体可以通过丙烯酸甲酯(或甲基丙烯酸甲酯）和具有通式B所示结构的链烷醇胺在催化剂(钛酸异丙酯等)和阻聚剂(吩噻嗪等）的存在下酯交换反应得到(参见《钛酸异丙酯催化酯交换合成甲基丙烯酸二甲氨基乙酯》，张光旭等，石油化工，2008,27(11): 1160-1165)。 Having the formula (12) may be a monomer represented by the structure of acrylate (or methacrylate) alkanolamine having the structure shown in Formula B catalyst (isopropyl titanate, etc.) 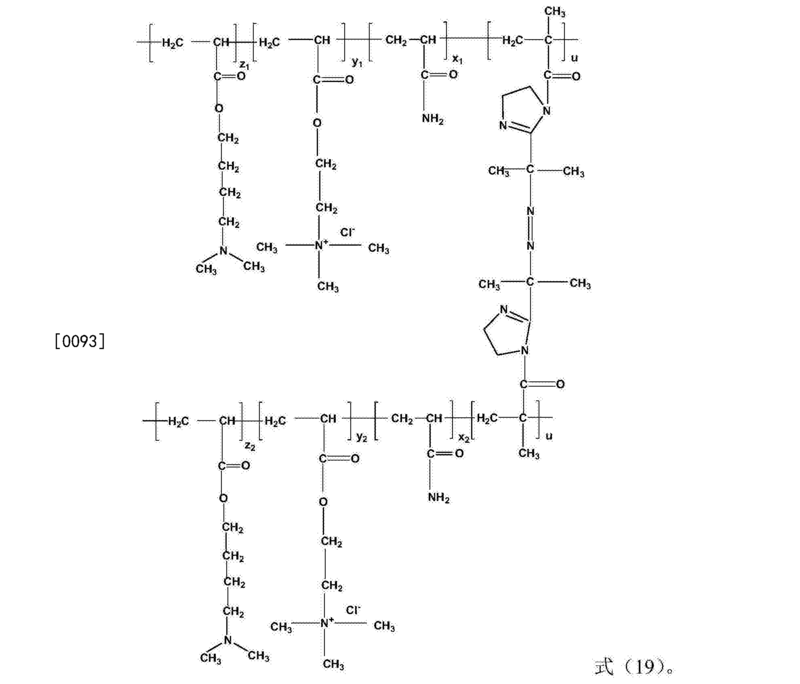 and a polymerization the presence of (phenothiazine) transesterification reaction (see "isopropyl titanate transesterification synthesis of dimethylaminoethyl methacrylate", and other Zhang Guangxu, petrochemical, 2008,27 (11): 1160 -1165). 此外，本发明还提供一种丙烯酰胺系共聚物的制备方法，该制备方法包括将水相和油相混合形成反相乳液，然后在乳液聚合反应条件下，在引发剂的存在下，将该反相乳液进行聚合反应，所述水相为含有单体混合物的水溶液，所述油相含有有机溶剂和乳化剂，其中，所述单体混合物含有单体E、单体F、单体G和单体H，所述单体E为上述式(5)所示的单体， 所述单体F为上述式(6)所示的单体，所述单体G为上述式(7)所示的单体，所述单体H为上述式(8)所示的单体，且以所述单体混合物中单体的总摩尔数为基准，所述单体E的含量为5-95摩尔％，优选为10-70摩尔％，更优选为50-70摩尔％ ;所述单体F的含量为2.5-90摩尔％， 优选为5-60摩尔％，更优选为20-40摩尔％ ;所述单体G的含量为0.5-90摩尔％，优选为5-30 摩尔％，更优选为5-20摩尔％，所述单体H的含量为0.0001-1摩尔  Further, the present invention also provides a process for preparing an acrylamide-based copolymer, which method comprises preparing the aqueous and oil phases mixed to form a reverse phase emulsion, and then the reaction under emulsion polymerization conditions in the presence of an initiator , the inverse emulsion polymerization reaction, the aqueous phase is an aqueous solution containing a monomer mixture, the oil phase contains an organic solvent and emulsifier, wherein the monomer mixture containing the monomer E, monomer F., single G monomers and body H, the E monomer is a monomer represented by the formula (5), F is the monomer is a monomer of formula G above (6) represented by the above formula ( 7) a monomer represented by the above-mentioned monomer is a monomer represented by the formula H (8), and the total moles of the monomer mixture of the monomers, the content of the monomer E is 5-95 mol%, preferably 10 to 70 mol%, more preferably 50-70 mol%; content of the monomer is 2.5 to 90 mole% F, preferably 5 to 60 mol%, more preferably 20 40 mol%; content of the monomer G is 0.5 to 90 mol%, preferably 5-30 mol%, more preferably 5 to 20 mol% of the monomer content of 0.0001 mol of H ％，优选为0.001-0.5摩尔％，更优选为〇. 005-0.2摩尔％ ;所述聚合反应的条件使得聚合反应后所得聚合物的粘均分子量为500万-1500万，优选为500万-1000万；式(5)-式(8)所不单体的选择与前文描述相同，在此不再赘述。 %, Preferably 0.001 to 0.5 mol%, more preferably square 005-0.2 mol%; polymerization conditions such that the viscosity of the resulting polymer after polymerization average molecular weight of 5 million 15 million, preferably 5,000,000 -. 10000000; of formula (5) - (8) are not monomers of the same selection and foregoing description, are not repeated here. 根据本发明，所述水相为含有单体混合物的水溶液。  According to the invention, the aqueous phase is an aqueous solution containing the monomer mixture. 所述单体混合物的重量与水和单体混合物的总重量的比例的选择与前文描述相同，此处不做赘述。 The weight ratio of water to the total weight of the monomer mixture and the monomer mixture is the same as selecting the foregoing description is not repeated here. 根据本发明，对所述水相和油相的重量比例没有特别的限制，只要使所述水相与油相充分混合形成反相乳液即可，优选情况下，所述水相和油相的重量比例为1:0.1-2,进一步优选为1:0.3-0.8。  According to the present invention, there is no particular limitation on the weight ratio of the aqueous phase and oil phase, the aqueous phase as long as the mixed oil phase inverse emulsion can be formed, preferably the case, and the aqueous phase oil phase weight ratio is 1: 0.1, more preferably 1: 0.3-0.8. 根据本发明，所述有机溶剂可以为本领域各种用于乳液聚合的与水互不相容的非极性或极性小的有机溶剂，例如可以为甲苯、二甲苯、己烷、环己烷、正庚烷、异构石蜡、异构烷烃、汽油、煤油和白油中的至少一种，优选情况下，所述有机溶剂为选自甲苯、二甲苯、正庚烷、异构烷烃、环己烷和煤油中的至少一种。 Incompatible with water, a non-polar or small polar organic solvent  According to the present invention, the organic solvent may be used in various emulsion polymerization art, for example, toluene, xylene, hexane , cyclohexane, n-heptane, isoparaffin, isoparaffins, gasoline, kerosene, white oil, and at least one, preferably, the organic solvent is selected from toluene, xylene, n-heptane, iso paraffins, at least one of cyclohexane and kerosene. 根据本发明，所述油相含有有机溶剂和乳化剂。  According to the present invention, the oil phase contains an organic solvent and emulsifiers. 对所述有机溶剂的用量没有特别的要求，可以在较宽的范围内变动，只要所述有机溶剂与乳化剂混合形成油相即可，优选情况下，以所述乳液的总重量为基准，所述有机溶剂的用量可以为10-60重量％，进一步优选为20-35重量％。 The amount of the organic solvent is not particularly required, may vary within a wide range, as long as the oil phase of the mixed organic solvent and emulsifiers is formed, Preferably, the total weight of the emulsion as a reference, the the amount of the organic solvent described later may be 10 to 60 wt%, more preferably 20-35 wt%. 根据本发明，所述乳化剂可以为本领域各种用于乳液聚合的非离子型乳化剂，例如可以为失水山梨醇脂肪酸酯、烷基酚聚氧乙烯醚、异构醇聚氧乙烯醚、月桂醇聚氧乙烯醚、丙二醇脂肪酸酯、月桂醇聚醚、苄基酚氧聚氧乙烯醚、苯乙基酚聚氧乙烯醚、聚氧乙烯失水山梨醇脂肪酸脂、失水山梨醇脂肪酸酯环氧乙烷加成物、苄基二甲基酚聚氧乙烯醚、脂肪醇聚氧乙烯醚和脂肪胺聚氧乙烯醚中的至少一种。  According to the invention, the emulsifying agent may be used art various non-ionic emulsion polymerization, for example, as sorbitan fatty acid esters, polyoxyethylene alkylphenol ether, isomeric alcohols polyoxyethylene ethers, polyoxyethylene lauryl alcohol ether, propylene glycol fatty acid esters, laureth, benzyl phenoxy polyoxyethylene ether, phenethyl phenol polyoxyethylene ethers, polyoxyethylene sorbitan fatty acid ester, sorbitan fatty acid ester ethylene oxide adduct, benzyl dimethyl phenol polyoxyethylene ethers, polyoxyethylene ethers of fatty alcohols and polyoxyethylene fatty amine of at least one vinyl ether. 优选情况下，所述乳化剂选自失水山梨醇脂肪酸酯、聚氧乙烯失水山梨醇脂肪酸脂、壬基酚聚氧乙烯醚、辛基酚聚氧乙烯醚、苄基酚氧聚氧乙烯醚、苯乙基酚聚氧乙烯醚、异构十三醇聚氧乙烯醚、月桂醇聚氧乙烯醚和苄基二甲基酚聚氧乙烯醚中的至少一种，进一步优选为由上述两种或两种以上的乳化剂组成的亲水亲油平衡值为5-9的复合乳化剂，例如可以为失水山梨醇脂肪酸酯和壬基酚聚氧乙烯醚。 Preferably, the emulsifier is selected from sorbitan fatty acid esters, polyoxyethylene sorbitan fatty acid ester, polyoxyethylene nonylphenol ether, polyoxyethylene octylphenol ether, polyoxyethylene phenoxy benzyl vinyl ether, phenethyl phenol polyoxyethylene ether, iso-tridecyl alcohol polyoxyethylene ether, polyoxyethylene lauryl ether and benzyl dimethyl phenol polyoxyethylene ether of at least one, and more preferably by the above of two or more of the emulsifiers hydrophilic-lipophilic balance value of the emulsifier 5-9, for example, sorbitan fatty acid esters, and polyoxyethylene nonylphenyl ether. 根据本发明，对所述乳化剂的用量没有特别地限定，可以在较宽的范围内变动，只要所述乳化剂与所述有机溶剂混合形成油相即可，优选情况下，以所述乳液的总重量为基准，所述乳化剂的用量可以为1-15重量％，进一步优选为2-10重量％。  According to the present invention, the amount of the emulsifier is not particularly limited, and may vary within a wide range, as long as the oil phase emulsifier with the organic solvent mixture is formed, Preferably, in the the total weight of the emulsion described later as a reference, the emulsifying agent may be used in an amount of 1-15 wt%, more preferably 2-10 wt%. 根据本发明，所述引发剂可以为本领域中各种引发剂，所述引发剂的选择与前文描述相同，此处不再赘述。  According to the invention, the initiator may be present in a variety of art initiators, the initiator and the same selection agent foregoing description is not repeated here. 本发明中，优选情况下，可先将偶氮系引发剂加入水相，再与油相混合形成反相乳液，然后将反相乳液与氧化还原系引发剂接触，通过氧化还原引发剂引发聚合反应。  In the present invention, preferably, the first azo initiator may be added to the aqueous phase, and then mixed with the oil phase inverse emulsion is formed, and then the inverse emulsion and redox initiator contacting through redox initiator polymerization initiator. 根据本发明，所述聚合反应还可以在各种助剂存在下进行，所述助剂可以选自螯合剂和其他助剂中的至少一种，所述助剂的选择与前文描述相同，此处不再赘述。  According to the present invention, the polymerization reaction may also be carried out in the presence of various adjuvants, the adjuvant may be selected from at least one chelating agent, and other additives, said additives selected with the foregoing description the same is not repeated here. 根据本发明中，对所述螯合剂的加料时机没有特别的要求，只要使螯合剂与金属离子发生螯合作用以使对共聚物起到稳定化作用即可，可以选择在水相加入或者在油相中加入，优选情况下，为了使螯合剂更充分的发挥稳定作用，可以选择在水相中加入螯合剂。  According to the present invention, there is no particular restriction on the addition timing of the chelating agent, as long as the chelating agent and metal ion chelation occurs to make copolymers can play a stabilizing effect may be selected in the aqueous phase was added in the oil phase was added or, preferably, the chelating agent to more fully stabilizing role, the option to add a chelating agent in the aqueous phase. 根据本发明，所述螯合剂的选择与前文描述相同，此处不再赘述。  According to the invention, the chelating agent is the same as selecting the foregoing description is not repeated here. 同样，本发明的发明人发现，在同时存在上述各种引发剂和助剂的条件下，反相乳液聚合法能够得到粘均分子量可控且溶解速度快的丙烯酰胺系共聚物。  Similarly, the present inventors found that, while the above-mentioned various conditions in the presence of initiators and additives, can be obtained by Inverse Emulsion viscosity average molecular weight and fast dissolution rate of the controlled acrylamide copolymer. 根据本发明，所述乳液聚合反应的条件可以为本领域常规的条件。  According to the invention, the emulsion polymerization conditions may be conventional in the field conditions. 所述聚合反应条件的选择与前文描述相同，此处不再赘述。 The same as the foregoing description of the selected polymerization conditions, and is not repeated here. 同样，本发明的发明人在研究中发现，采取下述条件能够进一步提高聚合物的分子量：即，优选地，所述乳液聚合反应的过程包括依次进行的两个阶段:第一阶段的反应条件包括:温度为0-20°C，优选为5-10°C，时间为1 _ 15小时，优选为1 -5小时;第二阶段的反应条件包括:温度为20_50°C，优选为25-45°C，时间为3-8小时，优选为2-5小时。  Similarly, the present inventors found that in the study, the following conditions take molecular weight polymers can be further improved: That is, preferably, the emulsion polymerization process comprises two stages carried out sequentially: a first stage the reaction conditions include: a temperature of 0-20 ° C, preferably 5-10 ° C, for 1 _ 15 hours, preferably 1 to 5 hours; the reaction conditions of the second stage comprising: a temperature 20_50 ° C, preferably of 25-45 ° C, the time is 3-8 hours, preferably 2-5 hours. 根据本发明，该方法还包括在所述聚合反应后将所述聚合反应所得产物与转相剂接触，以使所述聚合反应所得产物在压裂液应用中快速在水中溶解即可。  According to the invention, the method further comprising the polymerization reaction after the polymerization reaction product obtained with phase inversion agent into contact, so that the resulting polymerization reaction product can be quickly dissolved in water in the fracturing fluid applications . 所述转相剂可以为本领域用于乳液聚合的各种转相剂，只要使所述聚合反应所得产物的水溶性增加即可， 例如可以为聚氧乙烯失水山梨醇脂肪酸酯、壬基酚聚氧乙烯醚、辛基酚聚氧乙烯醚、苄基酚聚氧乙烯醚、苯乙基酚聚氧乙烯醚、异构十醇聚氧乙烯醚、异构十一醇聚氧乙烯醚、异构十三醇聚氧乙烯醚和脂肪胺聚氧乙烯醚的非离子型乳化剂中的至少一种，优选情况下，所述转相剂为选自聚氧乙烯失水山梨醇脂肪酸脂、异构十醇聚氧乙烯醚、异构十一醇聚氧乙烯醚、异构十三醇聚氧乙烯醚、壬基酚聚氧乙烯醚和辛基酚聚氧乙烯醚中的至少一种。 The phase transfer agent may be present a variety of phase-transfer agent for the emulsion polymerization art, so long as the polymerization reaction the resulting product can increase the water solubility, for example, sorbitan fatty acid esters polyoxyethylene, nonyl phenol polyoxyethylene ether, polyoxyethylene octylphenol ether, benzyl phenol polyoxyethylene ether, phenethyl phenol polyoxyethylene ether, isomeric ten alcohol polyoxyethylene ether, isomeric undecyl alcohol ethoxylates , iso-tridecyl alcohol polyoxyethylene ethers and polyoxyethylene fatty amine polyglycol ether nonionic emulsifier is at least one, preferably, the phase transfer agent is selected from polyoxyethylene sorbitan fatty acid ester , ten isomeric alcohol polyoxyethylene ether, at least one isomeric undecyl alcohol polyoxyethylene ether, iso-tridecyl alcohol polyoxyethylene ether, polyoxyethylene nonylphenol ether and polyoxyethylene octylphenol ether . 根据本发明，对所述转相剂的用量没有特别的要求，只要可以使所述聚合反应所得产物在压裂液应用中快速在水中溶解即可，所述转相剂的用量使得：以所述乳液的总重量为基准，所述转相剂的用量可以为0.5-10重量％，优选为1 -4重量％。  According to the present invention, no special requirements for the amount of phase transfer agent, the polymerization reaction may be as long as the resulting product can be quickly dissolved in water in the fracturing fluid applications, the phase transfer agent in an amount such that : based on the total weight of the emulsion as a reference, the phase transfer agent may be used in an amount of 0.5 to 10 wt%, preferably 1-4 wt%. 此外，本发明的发明人在研究中发现，当选择特定的单体E、单体F、单体G和单体H 进行反应时，能够进一步提高所得的聚合物的降阻效果。  Further, the present inventors found that in the study, when selecting a specific monomer E, F. Monomers, monomers G and H is reacted monomers, can be further improved reduction in resistance of the resulting polymer. 例如，优选地，当Rd，各自独立地为H或者甲基，R 3为亚乙基（如，-CH2CH2-)，R4、、R6、Rio、Rii、R12、R13、Ri4、R12 '、Ri3 ' 和Ri4' 各自独立地为甲基;为cr。 For example, preferably, when Rd, each independently H or methyl, R 3 is an ethylene group (e.g., -CH2CH2 -), R4,, R6, Rio, Rii, R12, R13, Ri4, R12 ', Ri3 'and Ri4 to' are each independently methyl; as cr. 即，所述单体E为式(7)所示的单体，其中，RiSH或甲基，所述单体F 为式（13)所示的单体，所述单体G为式（11)所示的单体和/或式（12)所示的单体，所述单体H 为式（14)所示的单体，式(7)、式(11)-式（14)所示单体的选择与前文描述相同，在此不再赘述。 That monomer, the monomer represented by the formula E (7) a monomer, wherein, RISH or methyl, F is the monomer represented by the formula (13), the monomer of formula G (11 ) a monomer and / or (12) a monomer represented by the formula H (14) shown in the formula (7), (11) - of formula (14) shown with selected monomers foregoing description the same, are not repeated here. 此外，本发明还提供了所述丙烯酰胺系共聚物在减阻剂中的应用。  Further, the present invention also provides the use of the acrylamide copolymer in the drag reducing agent. 采用本发明提供的所述丙烯酰胺系共聚物作为压裂液减阻剂，可以获得高而稳定的减阻率，具体的应用方法为本领域技术人员所熟知的技术。 Employing the acrylamide copolymer of the present invention provides a fracturing fluid drag reducing agent, a high and stable rate of drag reduction, the specific application methods well known to those skilled in the art. 以下将通过实施例对本发明进行详细描述。  will be described in detail by way of examples of the present invention. 应当理解的是，此处所描述的具体实施方式仅用于说明和解释本发明，并不用于限制本发明。 It should be understood that the specific embodiments described herein are only to illustrate and explain the present invention and are not intended to limit the present invention. 特性粘数[n]根据GB12005.1-89聚丙烯酰胺特性粘数测定方法进行测定;粘均分子量按照公式Mv = ( [n]/K)Ua，其中K = 4.5 X 1(T3，a = 〇. 80进行计算；溶解时间按GB12500.8-89进行测定(样品质量均按样品内纯聚合物质量计），测得的粉末状样品溶解时间均小于20min，乳液样品溶解时间均小于5min;分子结构及结构单元的组成采用IR光谱和13C-NMR测定;水不溶物含量按SY/T 5862-1993测定;室内减阻率按SY/T 6376-2008测定。  The intrinsic viscosity [n] measured in accordance GB12005.1-89 polyacrylamide intrinsic viscosity measurement method; viscosity-average molecular weight according to the equation Mv = ([n] / K) Ua, where K = 4.5 X 1 (T3 , a = 80 square calculation; dissolution time is measured (sample mass are by mass of pure polymer in the sample) by GB12500.8-89, powder samples measured dissolution time is less than 20min, each emulsion sample dissolution time less than 5min; constituent unit structure and a molecular structure was determined by IR spectroscopy and 13C-NMR; water insoluble matter by SY / T 5862-1993 measurement; drag reduction rate measured by the indoor SY / T 6376-2008. 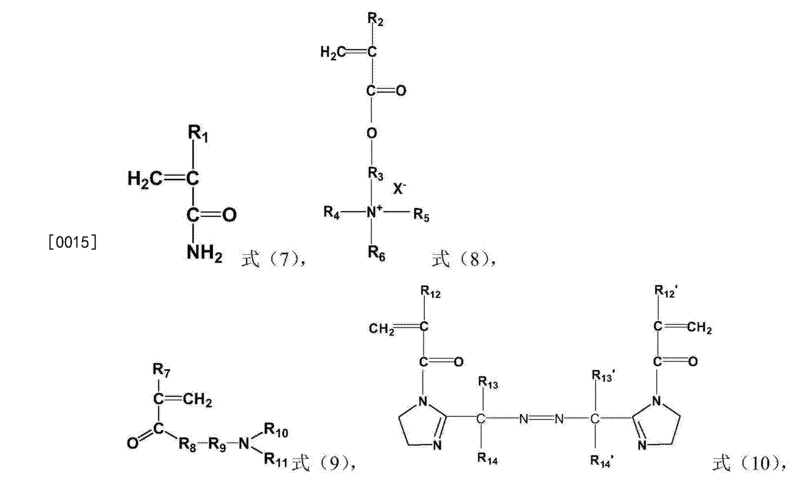 下述实施例中式（15)所示的单体Ml和式（18)所示的单体M3购自Sigma-Aldrich公司，除此之外，除非特殊说明，实施例、对比例和测试例中用到的试剂等均为市售品。  Examples of the monomer of formula (15) and Ml monomer of formula (18) represented by the following embodiment M3 purchased from Sigma-Aldrich Corporation, in addition, unless otherwise noted, embodiments and comparative the reagents used in the test cases are commercially available. 本实施例用于说明本发明提供的溶液聚合法制备丙烯酰胺系共聚物。  The present embodiment used in the solution polymerization of acrylamide-based copolymer of the present invention is provided to illustrate the preparation. 室温下，将4.26g的丙烯酰胺(AM)、74.68g的式（15)所示的Ml单体、30.13g的N-(3-二甲氨基丙基）甲基丙烯酰胺(购自Sigma-Aldrich公司，以下相同）和1.16g的式（16)所示的M2单体(根据JP08217755A中实施例1记载的方法制备，以下相同）的方法制得，加入到反应瓶中，加入去离子水624.64g，搅拌使单体完全溶解，并搅拌均匀。  A mixture of 4.26g of methacrylamide acrylamide (AM), 74.68g of formula (15) Ml monomer represented, 30.13 g of N- (3- dimethylaminopropyl) (commercially from Sigma-Aldrich Corporation, hereinafter the same) and formula (16) 1.16g of the monomer M2 (prepared as described in Example 1 according to JP08217755A, hereinafter the same) obtained by the method, is added to the reaction flask, 624.64g of deionized water, and stirred to completely dissolve the monomers, and stir. 分别向烧瓶中加入1重量％的£01六水溶液5.5g，1重量％的2，2 '偶氮二异丁基脒盐酸盐水溶液2. lg，加入0.1重量％的亚硫酸氢钠溶液1.1 g，尿素0.12g，充分搅拌使其混合均匀。 They were added to the flask 1 wt% aqueous solution of £ 01 six 5.5g, 1 wt% of 2,2'-azobis isobutyl amidine hydrochloride solution 2. lg, 0.1 wt% solution of sodium bisulfite 1.1 g, urea 0.12g, sufficiently stirred to mix uniformly. 用10重量％的氢氧化钠溶液调节pH至7.5。 PH was adjusted to 7.5 with 10 wt% sodium hydroxide solution. 控制体系初始温度至4°C，通氮气除氧30分钟后，加入1重量％过硫酸铵水溶液0.45g，并继续通氮除氧20分钟。 The initial temperature control system to 4 ° C, the deoxygenated nitrogen for 30 minutes, 1 wt% aqueous solution of ammonium persulfate 0.45g, nitrogen and oxygen was continuously for 20 minutes. 将反应器密闭，保持在4°C，反应8小时后，将温度升至20°C后反应5小时，然后将温度升至45°C反应2小时，将得到的胶状产物取出，经造粒、干燥、粉碎即可获到丙烯酰胺系共聚物P1。 The reactor was sealed and kept at 4 ° C, the reaction for 8 hours, the temperature was raised to 20 ° C after the reaction for 5 hours, and then the temperature was raised to 45 ° C for 2 hours, the resulting gum product is removed by making granulated, dried and pulverized to get acrylamide copolymer P1. 按照实施例1的方法制备丙烯酰胺系共聚物，不同的是，不加入Ml单体、N-(3_二甲氨基丙基）甲基丙烯酰胺和M2单体，将丙烯酰胺与相同摩尔数的（3-丙烯酰胺基-3-甲基)丁基三甲基氯化铵进行聚合反应，从而得到二元共聚物DPI，测得其粘均分子量M v为1452万。  acrylamide copolymer prepared as in Example 1, except that no addition of monomer Ml, N- (3_ dimethylaminopropyl) methacrylamide and M2 monomers, acrylamide and the same number of moles of (3-acrylamido-3-methyl) butyl-trimethylammonium chloride polymerization reaction, thereby obtaining the DPI binary copolymer, obtaining the measured viscosity average molecular weight M v of 14,520,000. 将29 • 85g的丙烯酰胺(AM)、5 • 80g的式（18)所示的M3单体、25 • 44g的N-(4-二甲氨基丁基）丙稀酸酯（购自Sigma-Aldrich公司，以下相同）和0.46g的式（16)所示的M2单体加入到聚合瓶中，加入143.62g去离子水，搅拌使单体完全溶解，分别向烧瓶中加入1重量％的EDTA水溶液4.65g，加入1重量％偶氮二异丁基脒盐酸盐水溶液1.23g，加入0.1 %亚硫酸氢钠溶液1.15g，加入尿素0.1 lg，充分搅拌使其混合均匀。  The M3 29 • 85g monomer acrylamide (AM), Formula (18) shown in the 5 • 80g, 25 • 44g of N- (4- dimethylamino-butyl) ester of acrylic acid (commercially available from Sigma-Aldrich Corporation, hereinafter the same) formula (16) and 0.46g of M2 monomers added to the polymerization flask, 143.62g of deionized water and stirred to complete dissolution of the monomers, respectively, to the flask was added 1 wt. % aqueous solution of EDTA 4.65g, was added 1% by weight of azobis isobutyl amidine hydrochloride solution 1.23g, 0.1% sodium hydrogen sulfite solution, 1.15g, was added urea 0.1 lg, sufficiently stirred to mix uniformly. 用10重量％的氢氧化钠溶液调节pH 至7.1。 PH was adjusted to 7.1 with 10 wt% sodium hydroxide solution. 控制体系初始温度至10°C，通氮气除氧30分钟后，加入1重量％过硫酸铵水溶液l.〇g，并继续通氮除氧10分钟。 Control system to an initial temperature 10 ° C, the deoxygenated nitrogen for 30 minutes, 1 wt% aqueous solution of ammonium persulfate l.〇g, nitrogen and oxygen was continuously for 10 minutes. 将反应器密闭，保持在l〇°C，反应3小时后，升温至30°C，反应3小时后，升温至35°C反应12小时，将得到的胶状产物取出，经造粒、干燥、粉碎即可获到丙烯酰胺系共聚物P2。 The reactor was sealed and kept at l〇 ° C, after the reaction for 3 hours, warmed to 30 ° C, after the reaction for 3 hours, warmed to 35 ° C for 12 hours, the resulting gummy product was taken out, granulated, dried , to get into the pulverized acrylamide copolymer P2. 室温下，将25.53g的甲基丙烯酰胺、51.07g式（18)所示的M3单体、7.13g的N-(5-二甲氨基戊基）甲基丙烯酰胺(购自Sigma-Aldrich公司，以下相同）和0.002g的式（16)所示的M2单体到聚合瓶中，加入125.55g去离子水，搅拌使单体完全溶解，分别向烧瓶中加入1重量％的£014水溶液11.63 8，加入1重量％偶氮二异丁基脒盐酸盐水溶液2.138，加入0.1重量％亚硫酸氢钠溶液1.13g，加入尿素0.20g，充分搅拌使其混合均匀。  A mixture of 25.53g of methacrylamide, M3 51.07g monomers of formula (18) shown, 7.13g of N- (5- dimethylamino-pentyl) methacrylamide (available from Sigma -Aldrich, hereinafter the same) formula (16) and 0.002g of M2 monomers to the polymerization flask, 125.55g of deionized water and stirred to complete dissolution of the monomers, respectively, to the flask was added 1 wt% of £ an aqueous solution of 11.63 8 014, 1 wt% addition of azobis isobutyl amidine hydrochloride aqueous solution of 2.138, was added 0.1% by weight solution of 1.13 g of sodium hydrogen sulfite, 0.20 g of urea was added, mixed well until homogeneous. 用10重量％的氢氧化钠溶液调节pH至7.3。 PH was adjusted to 7.3 with 10 wt% sodium hydroxide solution. 控制体系初始温度至8°C，通氮气除氧30分钟后，加入1 %过硫酸铵水溶液〇.4g，并继续通氮除氧10分钟。 The initial temperature control system to 8 ° C, the deoxygenated nitrogen for 30 minutes, a 1% aqueous ammonium persulfate solution 〇.4g, nitrogen and oxygen was continuously for 10 minutes. 将反应器密闭，保持在8°C，反应10小时后，升温至25°C， 反应4小时后，升温至40°C反应7小时，将得到的胶状产物取出，经造粒、干燥、粉碎即可获到丙烯酰胺系共聚物P3。 The reactor was sealed and kept at 8 ° C, after 10 hours, allowed to warm to 25 ° C, After 4 hours, the reaction was warmed to 40 ° C for 7 hours and the resulting gum product is removed, granulated, dried, to get into the pulverized acrylamide copolymer P3. 对P3进行各种测定，IR光谱中1660cm-1和1635cm-1处分别出现归属于酰胺基的酰胺I带吸收峰(c = 0伸缩振动)和酰胺n带吸收峰(NH弯曲振动），在1430OIT1处出现CN的伸缩振动吸收峰；1170CHT 1出现了M2单体CH3-C-CH3骨架振动的特征伸缩振动峰，可以确定得到的共聚物分子具有式(20)所示的结构，通过黏度法测得其黏均分子量Mv为650万，单体转化率为99.9%以上。  Various measurement pair P3, IR spectrum at 1660cm-1 and 1635cm-1 attributable to amide I band of the amide group absorption peak (c = 0 stretching vibration) and the n-band absorption peak of the amide (NH bending vibration appeared ), appears at the 1430OIT1 CN stretching vibration absorption peaks; 1170CHT 1 wherein the peak vibration occurred CH3-C-CH3 backbone monomer M2 stretching vibration, may be determined to obtain a copolymer having the molecular structure shown in formula (20), viscosity as measured by obtaining the viscosity average molecular weight Mv of 6,500,000, a monomer conversion of more than 99.9%. 其中，式(20)以及11^2、71、72、21、22和11仅表示出结构单元的类型和数目，而不表示结构单元的连接方式。 And wherein the number and the type of formula (20) 11 ^ 2,71,72,21,22 and 11 shows only a structural unit represented without connection structural units. XI、X2、yi、y2、zi、Z2和u的具体数值由投料量确定，分子结构式和结构单元的组成采用定量13C谱测定，其中，11、12、71、72、21、22、111和112的数值分别为(xi+X2): (yi+y2): (Z1+Z2) :u = l :0• 88:0.12:0.00002。 XI, specific values ​​X2, yi, y2, zi, Z2, and u is determined by the feeding amount, composition and molecular structure of the structural unit 13C quantitative spectroscopy, wherein 11,12,71,72,21,22,111 and values ​​were 112 (xi + X2): (yi + y2): (Z1 + Z2): u = l: 0 • 88: 0.12: 0.00002. 本实施例用于说明本发明提供的反相乳液聚合法制备丙烯酰胺系共聚物。 DESCRIPTION The present invention provides the inverted acrylamide copolymer Preparation  for the emulsion polymerization of the present embodiment. (1)将5.11g的甲基丙烯酰胺、74.68g的式（15)所示的Ml单体、30.13g的N-(3-二甲氨基丙基）甲基丙烯酰胺和1.16g的式（16)所示的M2单体加入到配置瓶中，加入181.24g去离子水，搅拌使单体完全溶解，分别向烧瓶中加入1重量％的£01六水溶液14.61 g，加入1重量％偶氮二异丁基脒盐酸盐水溶液l.〇3g，加入尿素0.15g，充分搅拌使其混合均匀，用10重量％的氢氧化钠溶液调节pH至7.1，得到水相。  (1) 5.11g of methacrylamide, Ml monomer represented by the formula (15) of 74.68g, 30.13g of N- (3- dimethylaminopropyl) methacrylamide and 1.16g of formula (16) was added to the configuration of monomer M2 flask, 181.24g of deionized water and stirred to complete dissolution of the monomers, were added 1% by weight aqueous solution of 14.61 g £ 01 six to the flask was added 1 wt. % azobis isobutyl amidine hydrochloride solution l.〇3g, urea was added 0.15g, sufficiently stirred and mixed with 10 wt% sodium hydroxide solution to adjust the pH to 7.1, to obtain an aqueous phase. (2)将失水山梨醇脂肪酸酯（8口31160,3181]^-六1(11'；[(311公司，以下相同）42.388，烷基酸聚氧乙稀醚（Igepal CA720，Sigma-Aldrich公司，以下相同）10g，194. llg煤油混合成油相，并将步骤(1)中得到的水相加入到全部油相中，通过高速混匀形成反相乳液加入到反应器中。  (2) a sorbitan fatty acid ester (8 31160,3181] ^ - 1 six (11 '; [(311, hereinafter the same) 42.388, polyoxy ethylene alkyl ether acid (Igepal CA720 , Sigma-Aldrich Corporation, hereinafter the same) 10g, 194. llg synthetic kerosene mixed phase, and in step (1) obtained aqueous phase was added to the entire oil phase was added to the invert emulsion is formed by high-speed mixing reactor in. (3)控制体系初始温度5°C，通氮气除氧30分钟后，加入1重量％亚硫酸氢钠水溶液0.25g，再加入1重量％过硫酸铵水溶液1.0g并继续通氮除氧10分钟。  (3) control of the initial temperature of the system 5 ° C, deoxygenated nitrogen for 30 minutes, was added 1 wt% aqueous solution of sodium hydrogen sulfite 0.25g, was added 1 wt% aqueous solution of ammonium persulfate 1.0g and continues through the other nitrogen oxygen for 10 minutes. 将反应器密闭，保持在5°C，反应5小时后，升温至45°C，反应2小时。 The reactor was sealed and kept at 5 ° C, the reaction for 5 hours, warmed to 45 ° C, reacted for 2 hours. 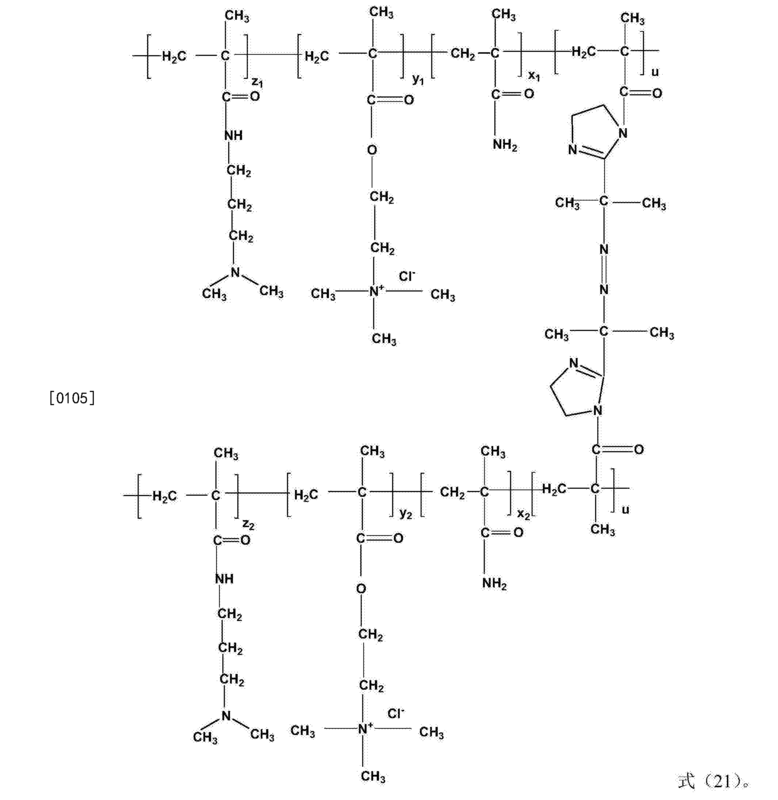 待反应温度冷却到室温后，加入22.18g壬基酚聚氧乙烯醚(Sigma-Aldrich公司，以下相同），用80目滤布过滤得到乳液状产品。 After the reaction was cooled to room temperature, was added 22.18g nonylphenol ether (Sigma-Aldrich Corporation, hereinafter the same), with 80 mesh filter cloth to obtain an emulsion-like product. 将反相乳液产品用丙酮和甲醇混合溶剂沉淀出来后，即可获得丙烯酰胺系共聚物P4。 After the inverse emulsion product precipitated with a mixed solvent of acetone and methanol, to obtain an acrylamide copolymer P4. 按照实施例4的方法制备丙烯酰胺系共聚物，不同的是，不加入Ml单体、N-(3_二甲氨基丙基）甲基丙烯酰胺和M2单体，将甲基丙烯酰胺与相同摩尔数的（3-丙烯酰胺基-3-甲基)丁基三甲基氯化铵进行聚合反应，从而得到二元共聚物DP2，测得其粘均分子量M v为945 万。  acrylamide copolymer prepared as in Example 4, except that no addition of monomer Ml, N- (3_ dimethylaminopropyl) methacrylamide and a monomer M2, methacryloyl the same number of moles of amide (3-acrylamido-3-methyl) butyl-trimethylammonium chloride polymerization reaction, thereby obtaining a binary copolymer DP2 is, obtaining the measured viscosity average molecular weight M v of 9,450,000. (1)将35.74g的甲基丙烯酰胺、5.80g的式（18)所示的M3单体、25.44g的N-(4-二甲氨基丁基）丙烯酸酯和〇.46g的式（16)所示的M2单体加入到配制瓶中，加入269.76g去离子水，搅拌使单体完全溶解，分别向烧瓶中加入1重量％的£01六水溶液7.83g，加入1重量％偶氮二异丁基脒盐酸盐水溶液2.03g，加入尿素0.10g，充分搅拌使其混合均匀，用15重量％的氢氧化钠溶液pH调节至7.0，得到水相。  M3 monomer (1) methacrylamide 35.74g of the formula (18) shown in 5.80g, 25.44 g of N- (4- dimethylamino-butyl) acrylate and the 〇.46g M2 monomer of formula (16) was added to the formulation vial, was added 269.76g of deionized water and stirred to complete dissolution of the monomers, were added 1% by weight aqueous solution of 7.83g of £ 01 to six flask, 1 wt% azobis isobutyl amidine hydrochloride 2.03 g of an aqueous solution, urea was added 0.10g, sufficiently stirred and mixed, was adjusted to 7.0 with 15 wt% sodium hydroxide solution the pH of the aqueous phase obtained. (2)将失水山梨醇脂肪酸酯（span60)40g，烷基酚聚氧乙烯醚（Igepal CA720) 3.39g，130.19g煤油混合成油相，并将步骤（1)中得到的水相全部加入到油相中，通过高速混匀形成反相乳液加入到反应器中。  (2) a sorbitan fatty acid ester (span60) 40g, polyoxyethylene alkyl phenol ether (Igepal CA720) 3.39g, 130.19g synthetic kerosene mixed phase, and in step (1) obtained in all aqueous phase was added to the oil phase was added to the reactor through a high speed kneading formed inverse emulsion. (3)控制体系初始温度10°C，通氮气除氧30分钟后，加入1重量％亚硫酸氢钠水溶液0.13g，再加入1重量％过硫酸铵水溶液0.63g，并继续通氮除氧10分钟。  (3) control of the initial temperature of the system 10 ° C, deoxygenated nitrogen for 30 minutes, was added 1 wt% aqueous solution of sodium hydrogen sulfite 0.13g, 1 wt% was added 0.63 g of ammonium persulfate aqueous solution, and nitrogen was continuously oxygen for 10 minutes. 将反应器密闭，保持在10°C，反应1小时后，升温至25°C，反应5小时，待反应温度冷却到室温后，加入10.41g壬基酚聚氧乙烯醚，用80目滤布过滤得到乳液状产品。 The reactor was sealed and maintained at 10 ° C, after 1 hour, warmed to 25 ° C, reacted for 5 hours, until the reaction was cooled to room temperature, was added 10.41g nonylphenol ether, with 80 mesh filter cloth filtration to obtain an emulsion-like product. 将反相乳液产品用丙酮和甲醇混合溶剂沉淀出来后，即可获得丙烯酰胺系共聚物P5。 After the inverse emulsion product precipitated with a mixed solvent of acetone and methanol, to obtain an acrylamide copolymer P5. (1)将21.32g的丙烯酰胺、51.07g的式（18)所示的M3单体、7.13g的N-(5-二甲氨基戊基）甲基丙烯酰胺和0.002g的式（16)所示的M2单体加入到配制瓶中，加入450.63g去离子水，搅拌使单体完全溶解，分别向烧瓶中加入1重量％的£01六水溶液8.5g，加入1重量％偶氮二异丁基脒盐酸盐水溶液2. lg，加入尿素0.08g，充分搅拌使其混合均匀，用10重量％的氢氧化钠溶液调节pH至7.1，得到水相。  M3 monomer (1) 21.32g of acrylamide, 51.07g of formula (18) shown, 7.13g of N- (5- dimethylamino-pentyl) methacrylamide and 0.002g of formula (16) was added to the monomer M2 represented formulated flask, 450.63g of deionized water and stirred to complete dissolution of the monomers, were added 1% by weight aqueous solution of 8.5g of £ 01 to six flask, 1 wt% coupling nitrogen diisobutylaluminum hydrochloride solution 2. lg, urea was added 0.08g, sufficiently stirred and mixed, the pH adjusted to 7.1 with 10 wt% sodium hydroxide solution, to obtain an aqueous phase. 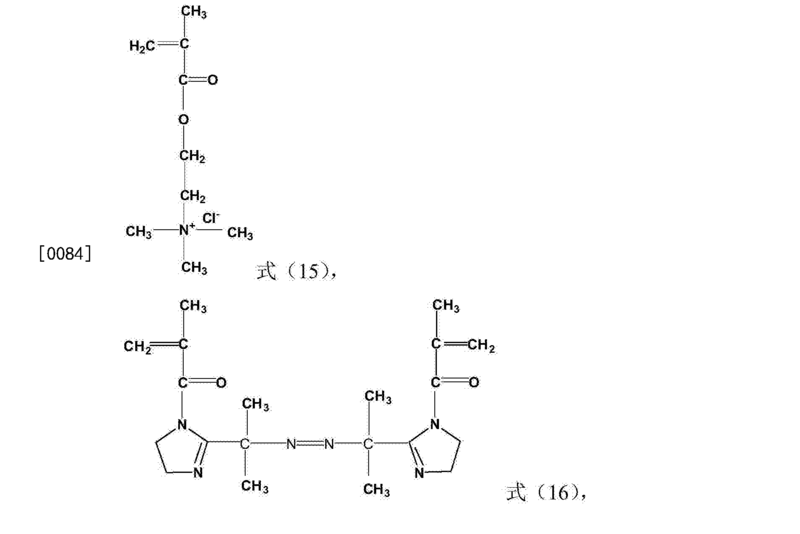 (2)将失水山梨醇脂肪酸酯（span60)10g，烷基酚聚氧乙烯醚（Igepal CA720， Sigma-Aldrich公司，以下相同）11.63g，162.25g煤油混合成油相，并将步骤（1)中得到水相加入到油相中，通过高速混匀形成反相乳液加入到反应器中。  (2) a sorbitan fatty acid ester (span60) 10g, polyoxyethylene alkyl phenol ether (Igepal CA720, Sigma-Aldrich Corporation, hereinafter the same) 11.63g, 162.25g synthetic kerosene mixed phase, and the obtained (1) step aqueous phase is added to the oil phase, is added to the invert emulsion formed in the reactor by a high speed mixing. (3)控制体系初始温度8°C，通氮气除氧30分钟后，加入1重量％亚硫酸氢钠水溶液0.18g，再加入1重量％过硫酸铵水溶液1.3g，并继续通氮除氧10分钟。  (3) control of the initial temperature of the system 8 ° C, deoxygenated nitrogen for 30 minutes, was added 1 wt% aqueous solution of sodium hydrogen sulfite 0.18g, was added 1 wt% aqueous solution of ammonium persulfate 1.3g, and continues through the nitrogen oxygen for 10 minutes. 将反应器密闭，保持在8°C，反应3小时后，升温至40°C，反应4小时，待反应温度冷却到室温后，加入7.03g壬基酚聚氧乙烯醚，用100目滤布过滤得到乳液状产品。 The reactor was sealed and kept at 8 ° C, after the reaction for 3 hours, warmed to 40 ° C, for 4 hours, until the reaction was cooled to room temperature, was added 7.03g of polyoxyethylene nonylphenol ether, with 100 mesh filter cloth filtration to obtain an emulsion-like product. 将反相乳液产品用丙酮和甲醇混合溶剂沉淀出来后，即可获得丙烯酰胺系共聚物P6。 After the inverse emulsion product precipitated with a mixed solvent of acetone and methanol, to obtain an acrylamide copolymer P6. 对P6进行各种测定，IR光谱中，1660CHT1和1635CHT1处分别出现归属于酰胺基的酰胺I带吸收峰(c = 0伸缩振动)和酰胺n带吸收峰(NH弯曲振动），在1430OIT1处出现CN的伸缩振动吸收峰，1170CHT1出现了M2单体CH3-C-CH3骨架振动的特征伸缩振动峰，1356CHT1和1401 cnf1出现典型的甲基对称弯曲振动吸收峰，1467CHT1出峰归属于-CH2-、-CH 3的CH弯曲振动。  Various assay to P6, the IR spectrum, 1660CHT1 and appeared at 1635CHT1 attributable to amide I band of the amide group absorption peak (c = 0 stretching vibration) and the absorption peak of the amide with n (NH bending vibration), in 1430OIT1 CN stretching vibration occurs at the absorption peak, 1170CHT1 characteristic peaks appeared vibration CH3-C-CH3 skeleton stretching vibration of the monomers M2, 1356CHT1 and 1401 cnf1 the typical symmetrical bending vibration absorption peak of methyl, 1467CHT1 peak attributable to - CH2 -, - CH CH 3 flexural vibration. 可以确定得到的共聚物分子具有式(23)所示的结构，通过黏度法测得其粘均分子量1¥为710万，单体转化率为99.9%以上。 It may determine the resulting copolymer having a molecular structure represented by Formula (23), as measured by viscosity method 1 ¥ obtaining the viscosity average molecular weight of 7,100,000, a monomer conversion of more than 99.9%. 其中，式(23)以及11^2、71、72、21、22和11仅表示出结构单元的类型和数目，而不表示结构单元的连接方式。 And wherein the number and the type of formula (23) 11 ^ 2,71,72,21,22 and 11 shows only a structural unit represented without connection structural units. 11、12、71、72、21、22和11的具体数值由投料量确定，分子结构式和结构单元的组成采用定量13c谱测定，其中，（X1+X2): (yi+y2): (Z1 +Z2) :u = 1:0• 88:0 • 12:0.00002。 Specific values ​​11,12,71,72,21,22 and 11 is determined by the feeding amount, composition and molecular structure of the structural unit 13c quantitative spectroscopy, wherein, (X1 + X2): (yi + y2): (Z1 + Z2): u = 1: 0 • 88: 0 • 12: 0.00002. 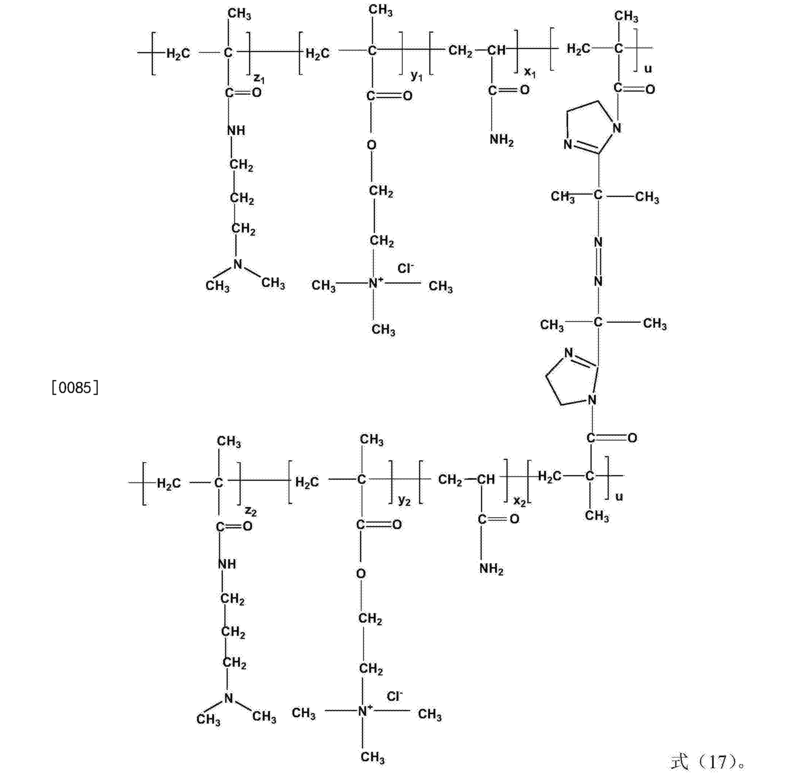 水不溶物是根据SY/T 5862-1993中规定的方法测定的。  water-insoluble substance according to the method specified in SY / T 5862-1993 in the assay. 将P1-P6、DP1、DP2和羟丙基瓜胶(JXY油井压裂羟丙基瓜胶粉，山东聚鑫化工有限公司，以下相同，）进行水溶性测定， 结果如表1所示。 The P1-P6, DP1, DP2 and hydroxypropyl guar (hydroxypropyl guar fracturing JXY powder, Shandong Xin Chemical Co., Ltd., hereinafter the same) of water-soluble measurement results are shown in Table 1. 从表1中可以看出，本发明提供的两种方法制备的丙烯酰胺系共聚物P1-P6中水不溶物含量明显低于现场施工中常用做减阻剂的羟丙基瓜胶，这说明与羟丙基瓜胶比，使用P1-P6作为页岩气压裂用减阻剂对地层的伤害低。  As can be seen from Table 1, content of water-insoluble acrylamide copolymer P1-P6 prepared by two methods of the present invention provides significantly lower than on-site construction of DRA commonly done hydroxypropyl guar gum , indicating that the ratio of hydroxypropyl guar gum, P1-P6 used as a drag reducing agent shale gas fracturing low formation damage. 在2500rpm剪切速率下，分别将？  at a shear rate of 2500rpm, respectively? 1-?6、0?1、0?2、部分水解聚丙烯酰胺(冊411，淄博天健化工有限公司，牌号TJY-1，粘均分子量为1000-1300万，下同）和各自分别地缓慢加入到体积比为80/20和60/40的水/醇溶液(本测试例中使用甲醇）中，P1-P6、DP1、DP2和部分水解聚丙烯酰胺的用量为水/醇溶液的0.01重量％ (样品质量按样品内纯聚合物质量计），溶解时间为30min，结果如表2所示。 1-? 6,0? 1,0? 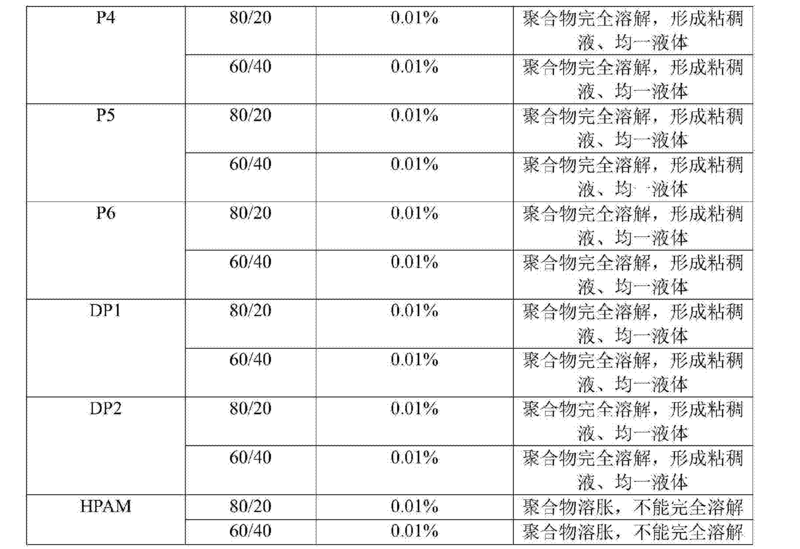 2, partially hydrolyzed polyacrylamide (Volume 411, Tianjian Zibo Chemical Co., Ltd., trademark TJY-1, 1000-1300 Wan viscosity average molecular weight, hereinafter the same) respectively, and are each (test Example using methanol present) was slowly added to a volume ratio of 80/20 and 60/40 of water / alcohol solution, P1-P6, DP1, DP2, and the amount of hydrolyzed polyacrylamide moiety is a water / alcohol solution 0.01 wt% (sample mass by the sample of the pure polymer mass), the dissolution time was 30min, the results shown in table 2. 从表2中可以看出，本发明提供的两种方法制备的丙烯酰胺系共聚物P1-P6作为页岩气压裂用减阻剂，与部分水解聚丙烯酰胺相比，与醇的配伍性好。  As can be seen from Table 2, acrylamide copolymers prepared according to the present invention provides two methods P1-P6 as shale gas fracturing a drag reducing agent, as compared with the partially hydrolyzed polyacrylamide, with an alcohol good compatibility. 在温度为25°C的条件下，将？  at a temperature of 25 ° C conditions, the? 1_?6、0?1、0?2、冊411和羟丙基瓜胶分别溶于纯水和浓度为2重量％、4重量％、8重量％、10重量％、12重量％的他(：1或KC1溶液中，将其配制成的500mg/L和1000mg/L的溶液（样品质量按样品内纯聚合物质量计），然后根据SY/T 6376-2008中规定的方法在GLM-1管路摩阻测定装置上测定上述溶液的减阻率，（测试条件：测试段管路的内径为8mm，测试段管路的长度为9m，栗注排量为30L/min )，结果如表3和表4所示。 1_? 6,0? 1,0? 2, volumes 411 and hydroxypropyl guar gum are dissolved in purified water in a concentration of 2 wt%, 4 wt%, 8 wt%, 10 wt%, 12 wt% of his ( : 1 or KC1 solution, which was formulated to 500mg / L and 1000mg / L solution (pure polymer sample mass by the mass of the sample), then in accordance with the method specified in SY / T 6376-2008 in the GLM-1 of the solution was measured drag reduction device, pipe friction was measured (test conditions: the inner diameter of the pipeline test section was 8mm, length of the test section duct is 9m, Li Note displacement 30L / min), the results in table 3 and table 4. 从表3和表4中可以看出，本发明提供的两种方法制备的丙烯酰胺系共聚物P1-P6 作为页岩气压裂用减阻剂，与羟丙基瓜胶、HPAM、DP1和DP2相比，与粘土稳定剂(如，KC1和NaCl)配伍性好，抗盐性能优异。  From Tables 3 and 4 can be seen, an acrylamide-based copolymer prepared according to the present invention provides two methods P1-P6 as shale gas fracturing a drag reducing agent, hydroxypropyl guar gum, of HPAM , DP1, and DP2 compared with the clay stabilizer (e.g., the KC1 and NaCl) good compatibility, excellent salt resistance. 降阻剂对岩心的伤害性按石油天然气行业标准SY/T 5107-2005《水基压裂液性能评价方法》中压裂液滤液对岩心基质渗透率损害实验进行，在美国岩心公司地层伤害测试仪器(FDS-800)上进行测试，岩心的基质渗透率为2md。  The reducing agent to the core by noxious oil and gas industry standard SY / T 5107-2005 "aqueous-based fracturing fluid performance evaluation method" in the fracturing fluid to the core matrix and the filtrate permeability damage experiment, in U.S. Core Laboratories formation damage tests on test equipment (FDS-800), the core matrix permeability 2md. 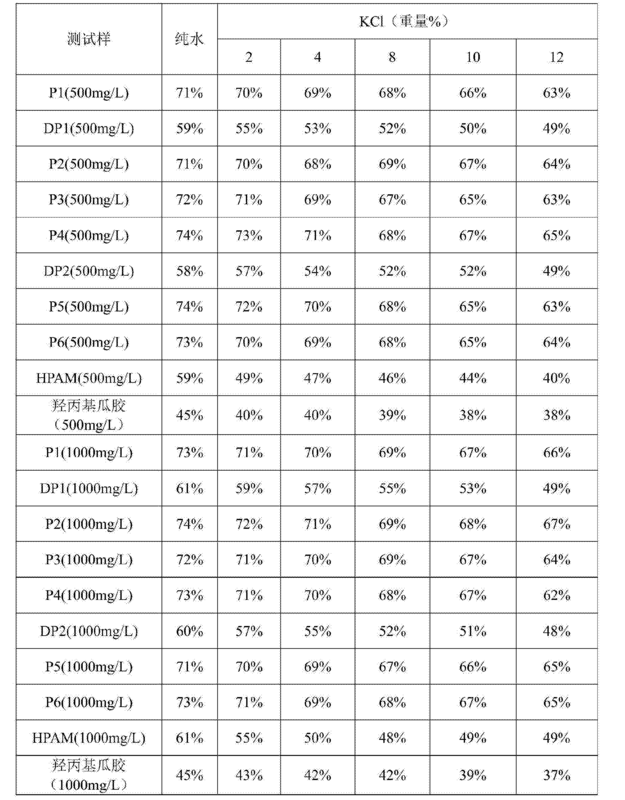 将P1-P6、DP1和DP2分别溶于纯水，将其配制成1000mg/L的溶液(样品质量按样品内纯聚合物质量计），在测试温度为65°C的条件下保存24hr，在美国岩心公司地层伤害测试系统(FDS-800)上测试其对岩心的伤害性，结果如表5所示。  The P1-P6, DP1 and DP2 are dissolved in purified water, formulated into 1000mg / L solution (sample mass by the sample of the pure polymer mass) stored at a temperature of 65 ° C test conditions 24hr, harmful to the core tested in the US company core formation damage test system (FDS-800), as shown in table 5. 从表5中可以看出，本发明提供的两种方法制备的丙烯酰胺系共聚物P1-P6对岩心的伤害明显低于现场施工中常用做减阻剂的对比样品，这说明使用P1-P6作为页岩气压裂用减阻剂对地层的伤害低。  As can be seen from Table 5, an acrylamide copolymer prepared P1-P6 according to the present invention provides two methods of core damage was significantly lower than on-site construction commonly used to make comparative DRA samples, indicating that the use of P1-P6 as shale gas fracturing with DRA low formation damage. 上述测试结果说明，本发明提供的丙烯酰胺系共聚物在水中的不溶物含量仅为0.01 % ;在2500rpm的剪切速率下，能完全溶解于水/醇溶液中，与醇的配伍性好，由于与醇和粘土稳定剂(NaCl或KC1)的配伍性提高，提高了抗滤失性能，并且在高盐和高剪切的条件下仍具有高的减阻率;在较低的地层温度(大于60°C)的条件下，具有自降解性，对地层的伤害低。  The test results show, the content of insolubles acrylamide copolymer of the present invention is provided in the water is only 0.01%; at a shear rate of 2500rpm, can be completely dissolved in water / alcohol solution, compatible with the alcohol good compatibility is improved since the clay stabilizer and an alcohol (NaCl or the KC1), and improved resistance to fluid loss properties, and still have a high drag reduction at high salt and high shear conditions; in the lower strata at a temperature (greater than 60 ° C), and having a self-degradable, low formation damage. 此外，本发明提供的丙烯酰胺系共聚物的制备方法具有简便且单体转化率高的优点。 Moreover, preparation of an acrylamide-based copolymer of the present invention to provide a simple and has the advantages of high monomer conversion. 以上详细描述了本发明的优选实施方式，但是，本发明并不限于上述实施方式中的具体细节，在本发明的技术构思范围内，可以对本发明的技术方案进行多种简单变型，这些简单变型均属于本发明的保护范围。  the foregoing detailed description of the preferred embodiments of the present invention, however, the present invention is not limited to the specific details of the above embodiment, within the technical spirit of the invention may be made more simple variations of aspect of the present invention, these simple modifications belong to the scope of the present invention. 另外需要说明的是，在上述具体实施方式中所描述的各个具体技术特征，在不矛盾的情况下，可以通过任何合适的方式进行组合。  Further to be noted that, in various specific features of the above-described specific embodiment described, without conflict, may be combined in any suitable manner. 为了避免不必要的重复，本发明对各种可能的组合方式不再另行说明。 To avoid unnecessary repetition, the present invention without further description of the various possible combinations. 此外，本发明的各种不同的实施方式之间也可以进行任意组合，只要其不违背本发明的思想，其同样应当视为本发明所公开的内容。  Further, among various embodiments of the present invention may be arbitrarily combined as long as it does not violate the spirit of the invention, which should also be considered as the disclosure of the present invention. 2. 根据权利要求1所述的丙烯酰胺系共聚物，其中，以所述丙烯酰胺系共聚物中结构单元的总摩尔数为基准，所述结构单元A的含量为10-70摩尔％，所述结构单元B的含量为5-60 摩尔％，所述结构单元C的含量为5-30摩尔％，所述结构单元D的含量为0.001-0.5摩尔％， 所述丙烯酰胺系共聚物的粘均分子量为500万-1000万。 The acrylamide copolymer according to claim 1, wherein, based on the total moles of acrylamide-based copolymer of the structural units, the content of the structural unit A is 10 to 70 mol%, the the content of said structural unit B is 5 to 60 mol%, the content of the structural unit C of 5 to 30 mol%, the content of the structural unit D is 0.001 to 0.5 mol%, the viscosity of the acrylamide copolymer average molecular weight of from 500 million to 10 million. 3. 根据权利要求1所述的丙烯酰胺系共聚物，其中，RjPR2各自独立地为Η或者甲基，R3 为亚乙基，1?4、1?5、1?6、1?1()、1?11、1?12、1?13、1?14、1?12'、1?13'和1?14'各自独立地为甲基;父-为(：1-。 3. 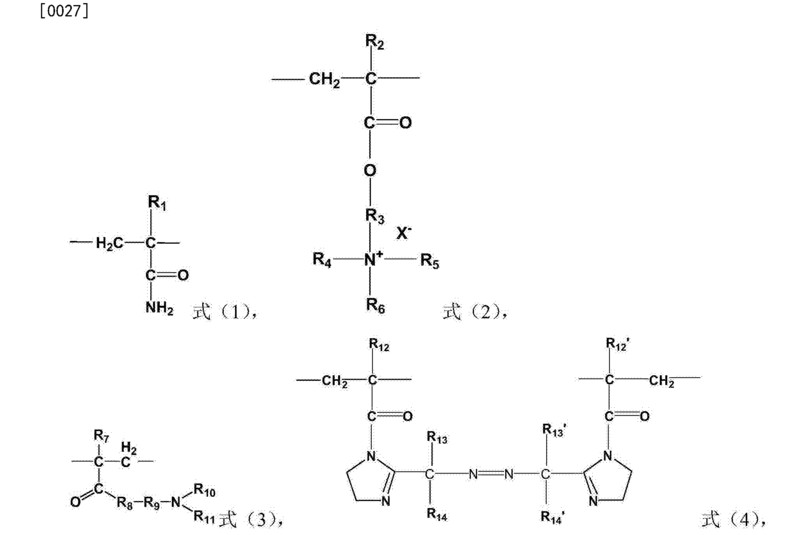 The acrylamide copolymer of claim 1, wherein, RjPR2 each independently Η or methyl, R3 is ethylene, 1? 4,1? 5,1? 6,1? 1 () , 12, 1 1 11,1 13,1 14,1 12 ', 113?' and 114 'are each independently methyl; parent - is (:?????? 1-. 其中，R7为Η或者C1-C2的烷基;η和p各自独立地为1-10的整数。 Wherein, R7 is a C1-C2 alkyl or Η of; [eta] and p are each independently an integer of 1-10. 7. 根据权利要求6所述的制备方法，其中，所述水相与油相的重量比为1:0.1-2。 The production method according to claim 6, wherein the weight ratio of water phase to oil phase was 1: 0.1. 8. 根据权利要求7所述的制备方法，其中，所述水相与油相的重量比为1:0.3-0.8。 8. The production method according to claim 7, wherein the weight ratio of water phase to oil phase is 1: 0.3-0.8. 9. 根据权利要求6所述的制备方法，其中，以所述乳液的总重量为基准，所述有机溶剂的用量为10-60重量％，所述乳化剂的用量为1-15重量％。 9. The production method according to claim 6, wherein, based on the total weight of the emulsion as a reference, the amount of the organic solvent 10 to 60 wt%, the emulsifier in an amount of 1-15 wt%. 10. 根据权利要求9所述的制备方法，其中，以所述乳液的总重量为基准，所述有机溶剂的用量为20-35重量％，所述乳化剂的用量为2-10重量％。 10. The production method according to claim 9, wherein, based on the total weight of the emulsion as a reference, the organic solvent used in an amount of 20-35% by weight, the emulsifier in an amount of 2-10 wt%. 11. 根据权利要求6所述的制备方法，其中，该方法还包括在所述聚合反应后将所述聚合反应所得产物与转相剂接触。 The production method according to claim 6, wherein the method further comprises the resultant reaction product into contact with a phase inversion agent in the polymerization reaction after the polymerization. 12. 根据权利要求11所述的制备方法，其中，以所述乳液的总重量为基准，所述转相剂的用量为0.5-10重量％。 12. The production method according to claim 11, wherein, based on the total weight of the emulsion as a reference, the phase transfer agent is used in an amount of 0.5 to 10 wt%. 13. 根据权利要求12所述的制备方法，其中，以所述乳液的总重量为基准，所述转相剂的用量为1_4重量％。 13. 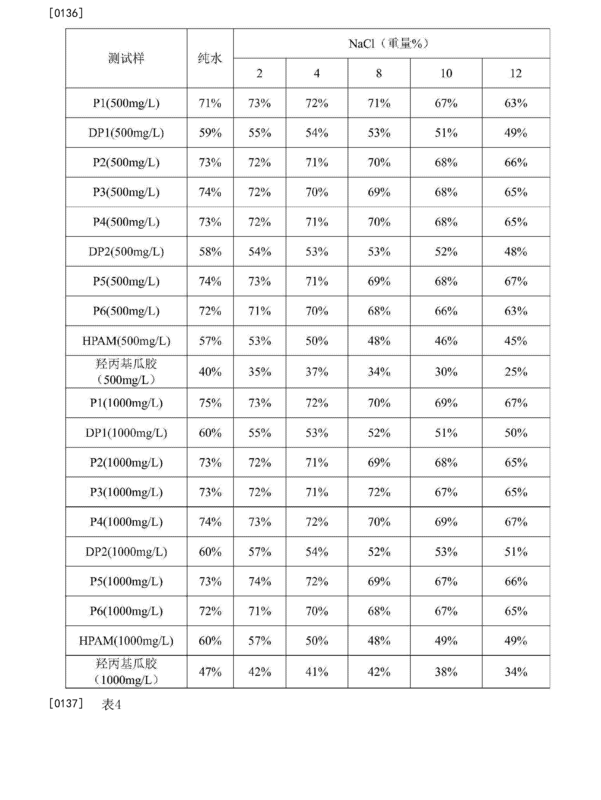 The production method according to claim 12, wherein, based on the total weight of the emulsion as a reference, the phase transfer agent in an amount of 1_4% by weight. 14. 根据权利要求5或6所述的制备方法，其中，以所述单体混合物中单体的总摩尔数为基准，所述单体E的含量为10-70摩尔％，所述单体F的含量为5-60摩尔％，所述单体G的含量为5-30摩尔％，所述单体Η的含量为0.001-0.5摩尔％ ;所述聚合反应的条件使得聚合反应后所得聚合物的粘均分子量为500万-1000万。 14. The production method of claim 5 or claim 6, wherein the total moles of the monomer mixture of the monomers, the content of the monomer E is 10-70 mol%, of the monomer F content of 5 to 60 mol% of the monomer content of 5 to 30 mol% G, the content of the monomer is 0.001 to 0.5 mol% Η; the polymerization conditions such that the resulting polymerization reaction after the polymerization viscosity-average molecular weight of 500 million to 10 million. 15. 根据权利要求5或6所述的制备方法，其中，RjPR2各自独立地为Η或者甲基，R3为亚乙基，1?4、1?5、1?6、1?10、1?11、1?12、1?13、1?14、1?12'、1?13'和1?14'各自独立地为甲基;父-为(：1-。 15. 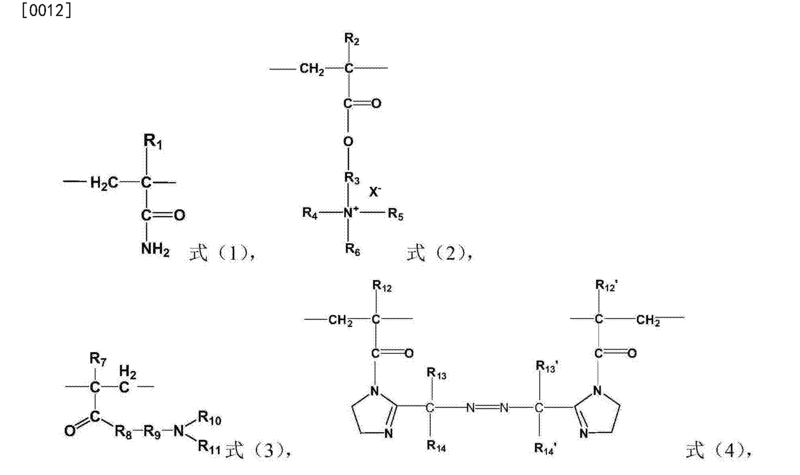 A preparation of claim 5 or claim 6, wherein, RjPR2 each independently Η or methyl, R3 is ethylene, 1? 4,1? 5,1? 6,1? 10, 1? ?? 12, 1 11,1 13,1 14,1 12 ', 113?' and 114 'are each independently methyl; parent - is (:??? 1-. 17. 根据权利要求5或6所述的制备方法，其中，所述单体混合物的重量与水和单体混合物的总重量的比值为0.05-0.5:1。 17. The production method of claim 5 or claim 6, wherein the ratio by weight of the total weight of the monomer mixture and water of the monomer mixture is from 0.05 to 0.5: 1. 18. 根据权利要求5或6所述的制备方法，其中，所述单体混合物的重量与水和单体混合物的总重量的比值为0.15-0.4:1。 18. The production method of claim 5 or claim 6, wherein the ratio by weight of the total weight of the monomer mixture and water of the monomer mixture is 0.15 to 0.4: 1. 19. 根据权利要求5或6所述的制备方法，其中，所述引发剂选自偶氮系引发剂和氧化还原系引发剂，以所述单体混合物中单体的总摩尔数为基准，所述偶氮系引发剂的用量为〇- 10摩尔％，所述氧化还原系引发剂的用量为0-10摩尔％，且所述引发剂的总用量为0.0001-1〇摩尔％ ;所述偶氮系引发剂选自2，2 ' -偶氮二异丁基脒盐酸盐和/或2，2 ' -偶氮二[2-( 2-咪唑啉-2-基)丙烷]二盐酸盐，所述氧化还原系引发剂包括氧化剂和还原剂，所述氧化剂与所述还原剂的摩尔比为0.5-3.5:1，所述氧化剂为选自过硫酸铵、过硫酸钾、过硫酸钠和过氧化氢中的至少一种;所述还原剂为无机还原剂、雕白粉、抗坏血酸和脲中的至少一种，所述无机还原剂为选自亚硫酸氢钠、亚硫酸钠、硫代硫酸钠、硫酸亚铁和保险粉中的至少一种。 19. 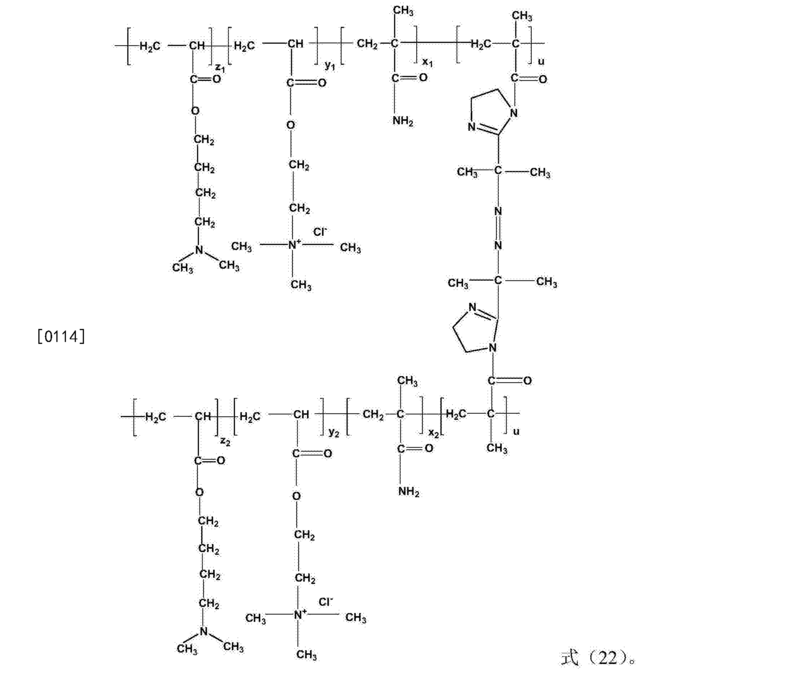 The production method of claim 5 or claim 6, wherein the initiator is selected from azo initiator and a redox initiator to the total moles of the monomer mixture of the monomers, the azo initiator is used in an amount of 10 mol% 〇-, the redox-based initiator is used in an amount of 0-10 mol%, and the total amount of initiator agent is 0.0001-1〇 mol%; the azo initiator is selected from 2,2 '- azobis isobutyl amidine hydrochloride, and / or 2,2' - azobis [2- (2-imidazolin-2-yl) propane] dihydrochloride salt, the redox-based initiator comprising an oxidizing agent and a reducing agent, the oxidizing agent and the reducing agent in a molar ratio of 0.5 to 3.5: 1, the oxidizing agent is selected from ammonium persulfate, potassium persulfate, persulfuric acid at least one of sodium and hydrogen peroxide; and the reducing agent is an inorganic reducing agent, rongalite, ascorbic acid and at least one of urea, the inorganic reducing agent selected from sodium bisulfite, sodium sulfite, thiosulfuric acid at least one of sodium, ferrous sulfate, and the sodium hydrosulfite. 20. 根据权利要求5或6所述的制备方法，其中，所述聚合反应在助剂存在下进行，所述助剂为选自螯合剂和其他助剂中的至少一种；以所述单体混合物的总摩尔数为基准，所述螯合剂的用量为0-2摩尔％，所述其他助剂的用量为0-2摩尔％，且以所述单体混合物中单体的总摩尔数为基准，所述助剂的总用量为0.0001-4摩尔％;所述螯合剂为选自乙二胺四乙酸二钠、二乙三胺五乙酸、柠檬酸、柠檬酸盐和聚羟基丙烯酸中的至少一种，所述其他助剂为选自尿素、甲酸钠、异丙醇和次磷酸钠中的至少一种。 20. 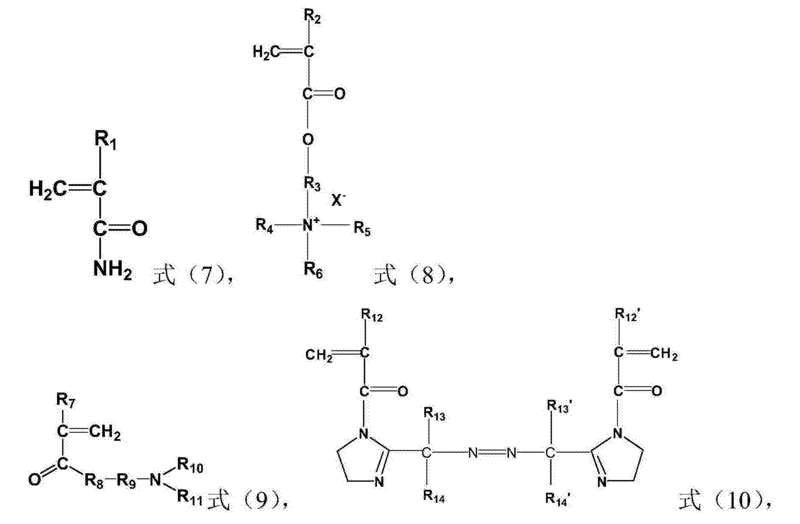 The production method of claim 5 or claim 6, wherein the polymerization reaction is carried out in the presence of adjuvant, said adjuvant is at least one selected from the chelating agents and other additives; to the single total number of moles of a mixture of reference, the chelating agent in an amount of 0-2 mol%, an amount of the other auxiliaries 0-2 mol%, and the total number of moles of monomers in the monomer mixture as a reference, a total amount of the aid is 0.0001 mol%; the chelating agent is disodium EDTA, diethylenetriamine pentaacetic acid, citric acid, citrates, and acrylic acid polyhydroxy is selected from ethylene diamine at least one of the other additives selected from urea, sodium formate, at least one of isopropyl alcohol and sodium hypophosphite. 21. 根据权利要求5所述的制备方法，其中，所述溶液聚合反应在惰性气体存在下进行， 聚合反应条件包括:温度为0-50°C，时间为1-24小时，pH值为5-13。 21. The production method according to claim 5, wherein the solution polymerization reaction is carried out in the presence of an inert gas, polymerization conditions comprising: a temperature of 0-50 ° C, time 1 to 24 hours, pH = 5 -13. 22. 根据权利要求6所述的制备方法，其中，所述乳液聚合反应在惰性气体存在下进行， 聚合反应条件包括:温度为0-50°C，时间为1-24小时，pH值为5-13。 22. The production method according to claim 6, wherein the emulsion polymerization reaction is carried out in the presence of an inert gas, polymerization conditions comprising: a temperature of 0-50 ° C, time 1 to 24 hours, pH = 5 -13. 23. 根据权利要求5或21所述的制备方法，其中，所述溶液聚合反应的过程包括依次进行的三个阶段，第一阶段的反应条件包括:温度为0-10°C，时间为1-15小时;第二阶段的反应条件包括:温度为15_30°C，时间为3-8小时;第三阶段的反应条件包括:温度为35-50°C， 时间为2-14小时。 23. 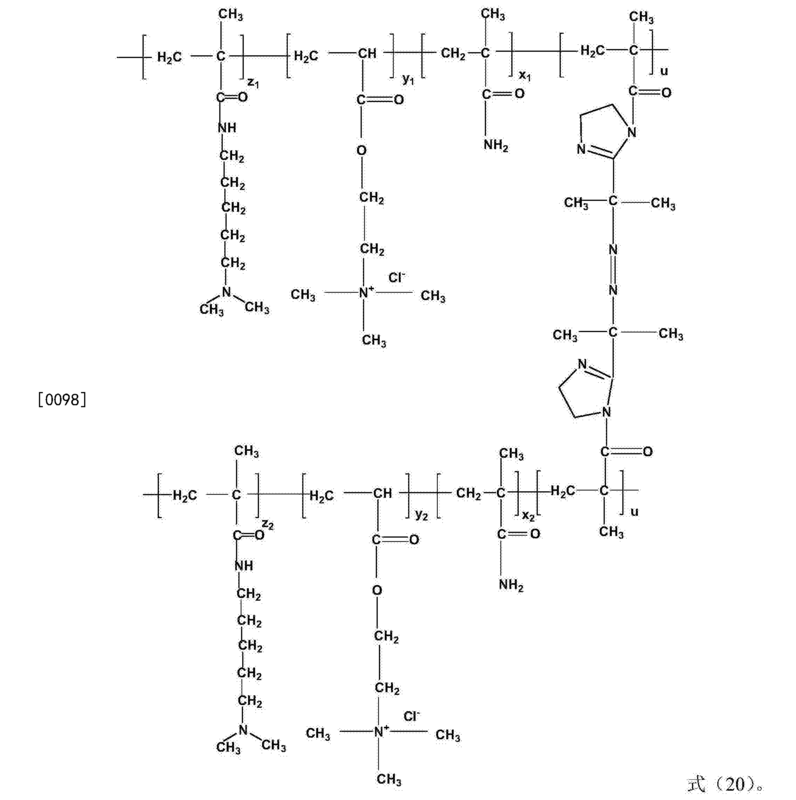 A process according to claim 5 or prepared as claimed in claim 21, wherein the solution polymerization include three stages sequentially, the conditions of the first reaction stage comprising: a temperature of 0-10 ° C, for 1 15 hours; the reaction conditions of the second stage comprising: a temperature 15_30 ° C, the time is 3-8 hours; the reaction conditions of the third stage comprising: a temperature of 35-50 ° C, time is 2-14 hours. 24. 根据权利要求6或22所述的制备方法，其中，所述乳液聚合反应的过程包括依次进行的两个阶段，第一阶段的反应条件包括:温度为0-20 °C，时间为1-15小时;第二阶段的反应条件包括:温度为20-50°C，时间为2-8小时。 24. 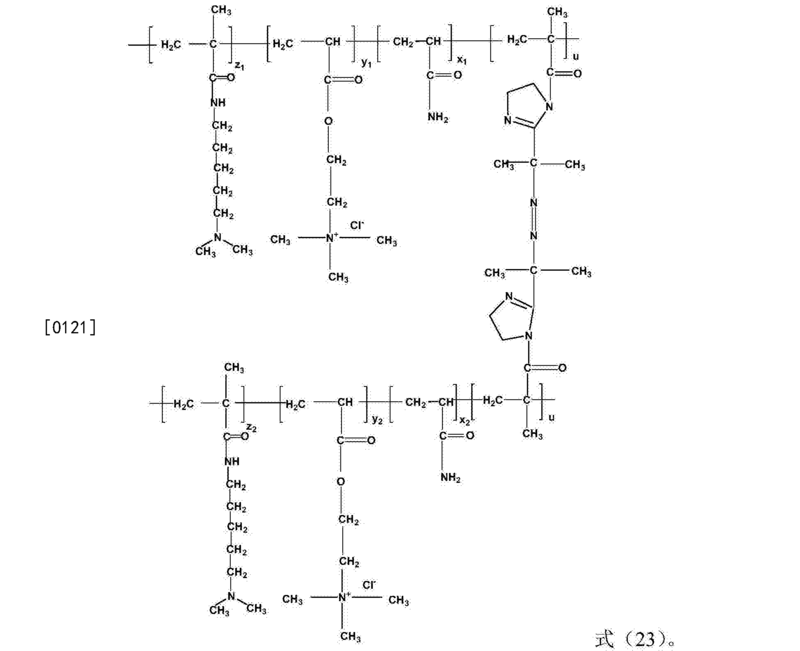 The production method of claim 6 or claim 22, wherein the emulsion polymerization process comprises two stages sequentially, the conditions of the first reaction stage comprising: a temperature of 0-20 ° C, for 1 15 hours; the second stage reaction conditions comprise: a temperature of 20-50 ° C, the time is 2-8 hours. 25. 权利要求1-4中任意一项所述的丙烯酰胺系共聚物或者由权利要求5-24中任意一项所述的方法制备得到的丙烯酰胺系共聚物作为减阻剂的应用。 1-4 acrylamide copolymer according to any one of claim 25 or any of claims 5-24 in the preparation of a copolymer of acrylamide obtained by the method of use as drag reducing agents.